Below are my processed versions of the original images available from NASA's Image Science and Analysis Laboratory which is also known as the Image Science Division (ISD). The original unprocessed (raw) film scans may be obtained from Image Science and Analysis Laboratory, NASA-Johnson Space Center and more specifically from their search page: The Gateway to Astronaut Photography of Earth. 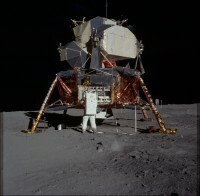 Simply select the appropriate Apollo mission (AS11 for example) and then the film roll letter. Alternatively you can search film rolls by number. 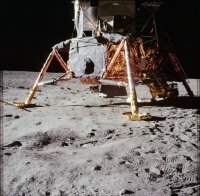 To search for all images on film roll 40 from Apollo 11, type in "AS11-40-*" (without quotes) into the right search field. 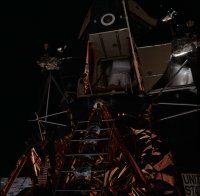 I use the ISD scans because their scans reach deep down into the film grain of their contact dupe films of the original Apollo mission films and because ISD doesn't perform any color corrections or other alterations to their scans. 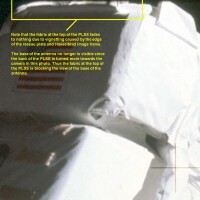 In other words the ISD scans represent the direct output from the film scanner. I spent a lot of time creating custom gamma and color correction curves for each film roll in order to compensate for the original film's aging, for color temperature shifts created by the contact duplication process of making dupes of the original Ektachrome mission films onto Kodachrome films, and to compensate for the somewhat nonlinear response of the film emulsion layers. My color correction curves were created relative to the green channel for two reasons. The first reason is that the scanner slowly accumulates a weak red undertone in the red channel as it scans. 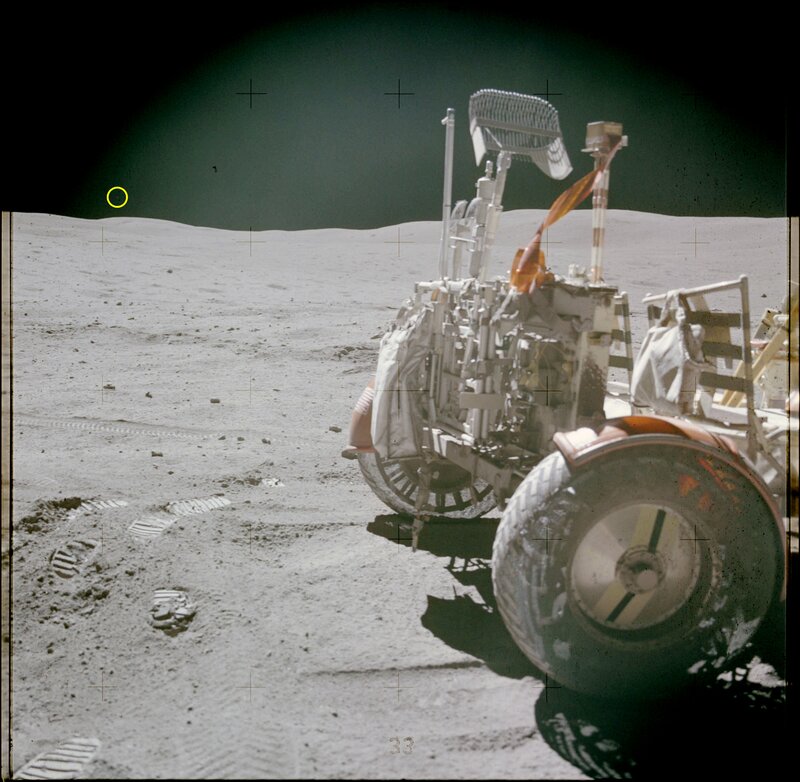 The second reason for color balancing relative to the green channel is that the blue layer of the original Ektachrome mission films tends to have the least linear response, particularly for extremely bright regions. 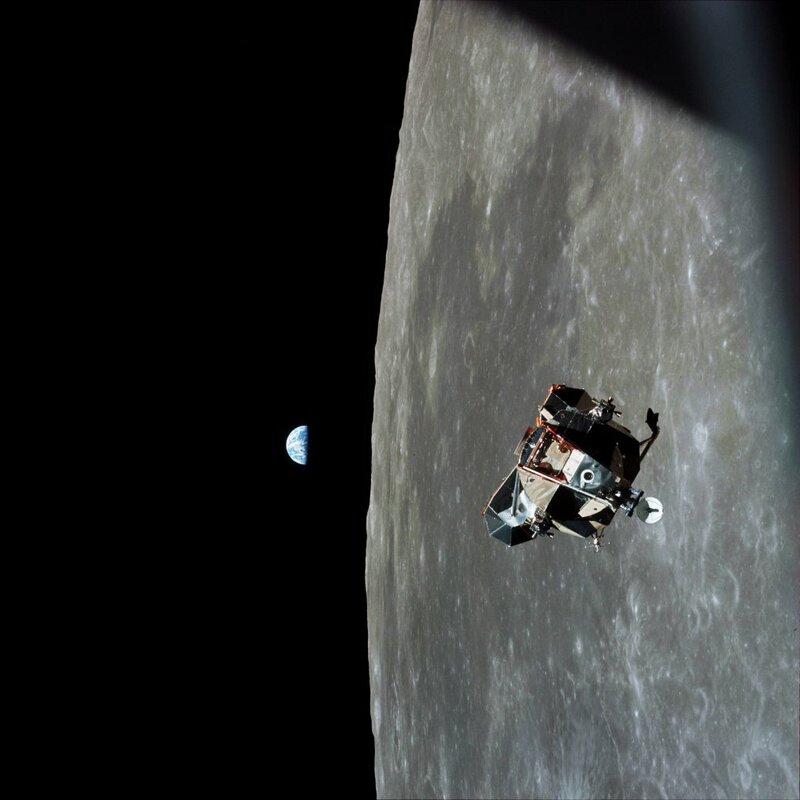 Photo 5390  Aldrin in LM while on the way to the moon. Photo 5390  My specially enhanced version of the left photo. 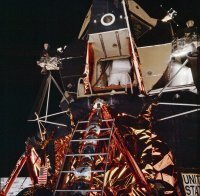 Photo 5862  Aldrin working his way through the LM hatch to start his EVA and become the second person to set foot on the moon. Photo has been color balanced. 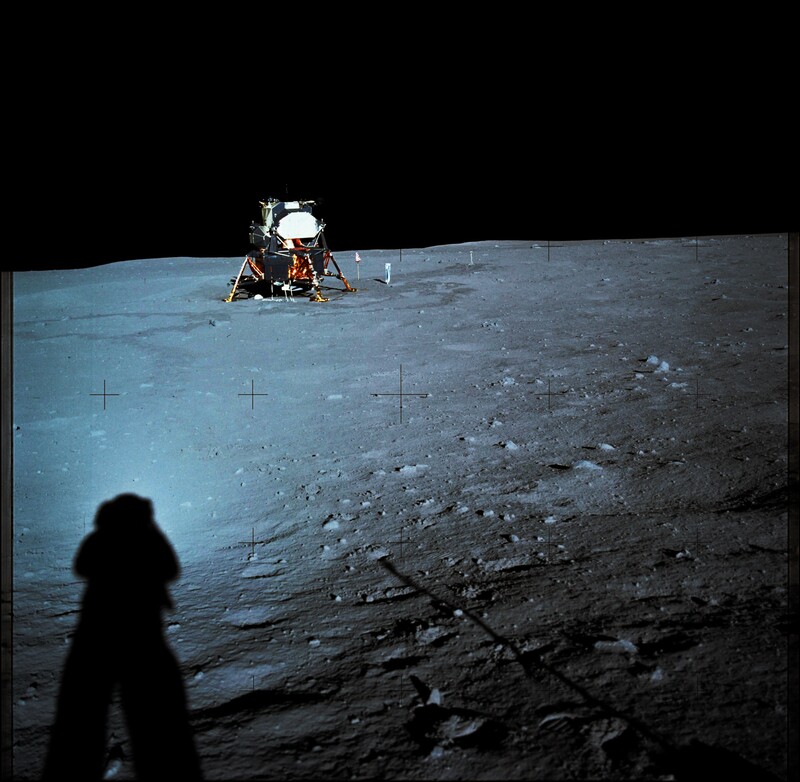 Armstrong likely was not standing fully bathed in sunlight since all shadows in this photo are extremely dark. This indicates that all LM shadow illumination strictly comes from the surrounding lunar surface which was not in the LM's shadow. The strongly gamma enhanced version of this photo, below, visually confirms this. 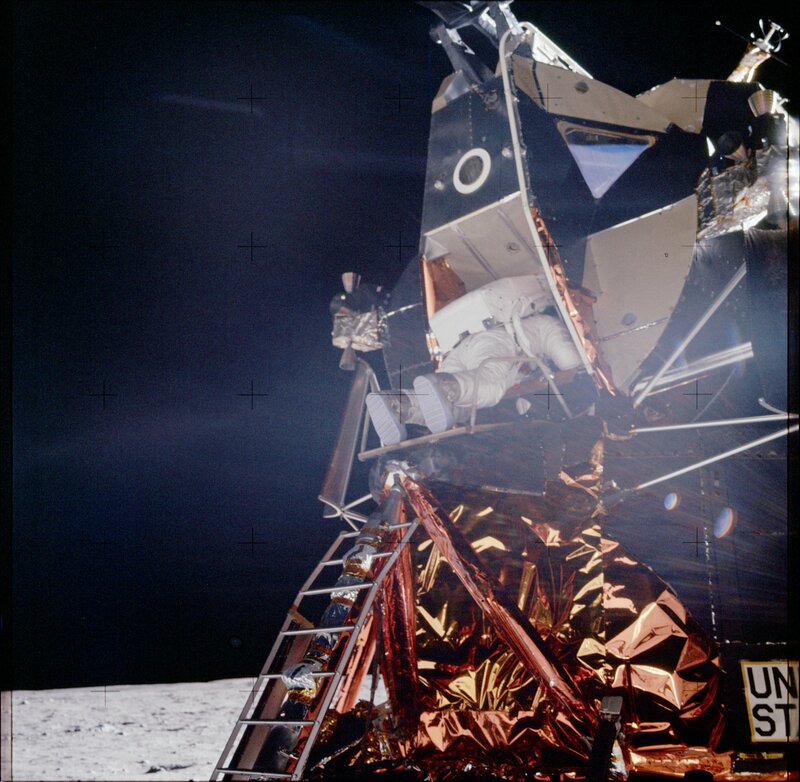 Photo 5862  My strongly enhanced version of the above photo, showing details of the front of the LM, porch, ladder and MESA area. 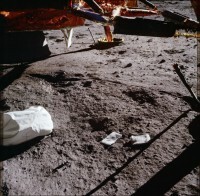 Note that what appears to be the flag in the right LM window is not the planted flag on lunar soil. 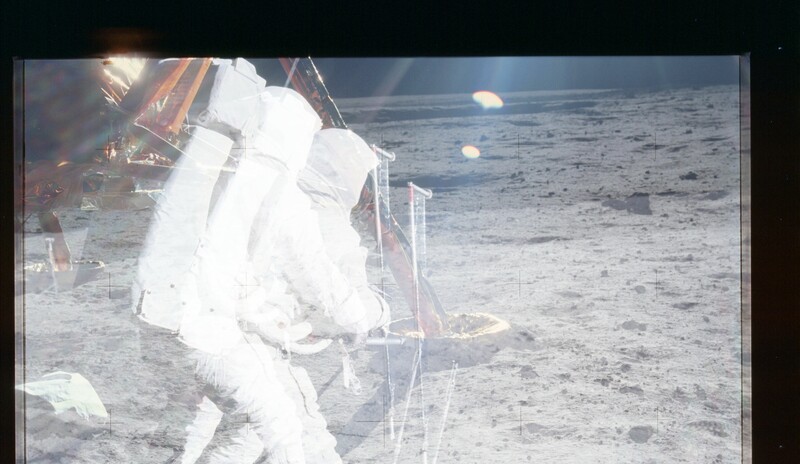 First, the slant of the window is way too steep for the window to reflect anything off of the lunar surface. Second, the "flag pole" really is the angle verniers placed on the inside of the window. 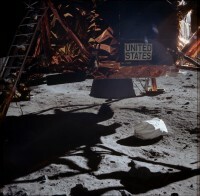 Third, the "flag" itself is the HUD viewfinder which is clearly visible in photo 5930 above. 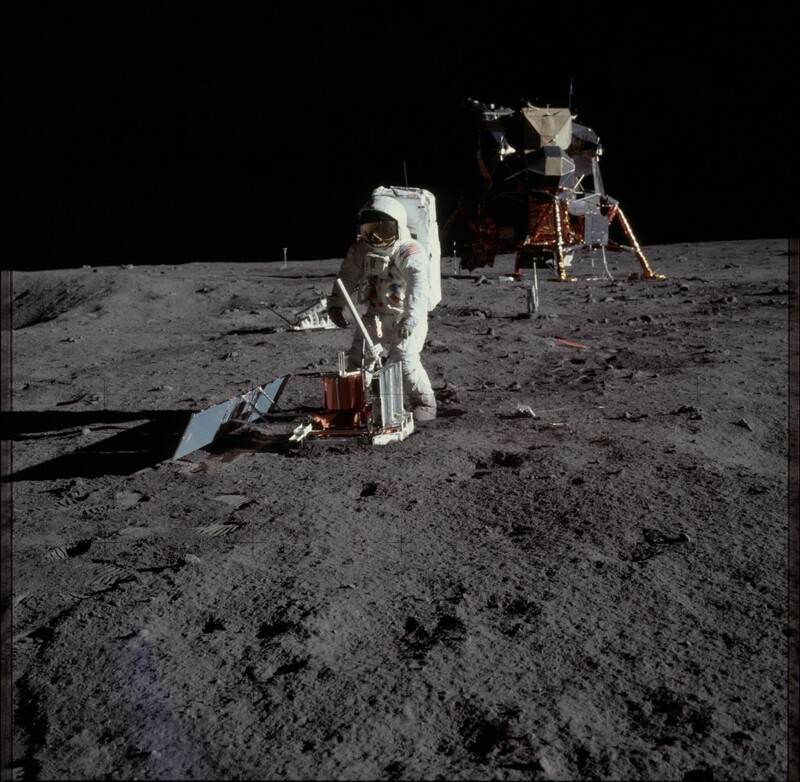 Photo 5863  Aldrin managing to actually get through the LM hatch and onto the porch. Photo has been color balanced. 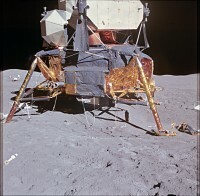 It is obvious that Armstrong is standing further to the right of the west LM landing strut compared to the above photo. It is important to note that Armstrong, standing in this fully sun exposed position, had his white space suit bathed in full sunlight. 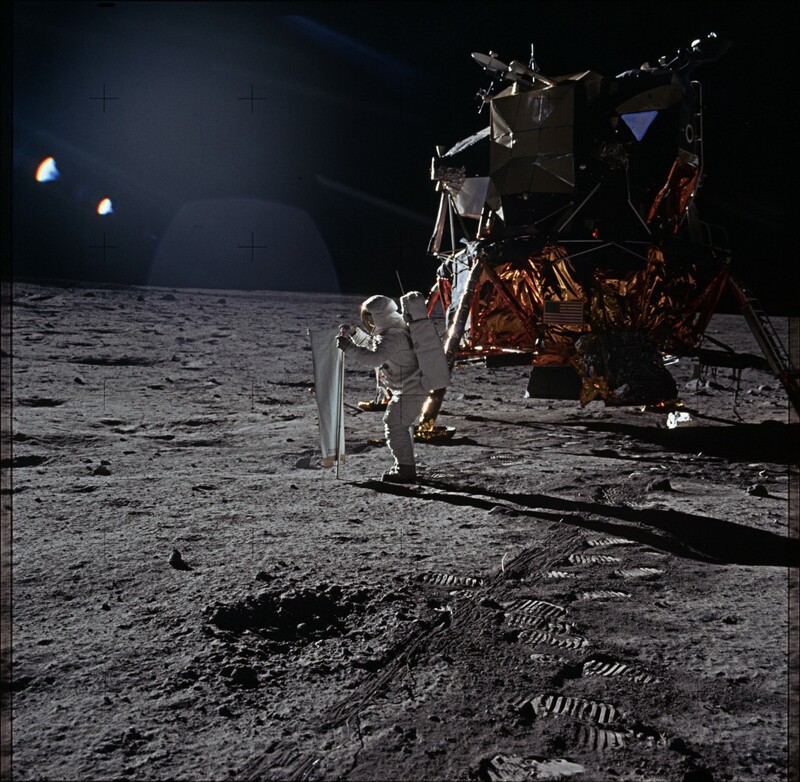 Thus his space suit acted as a diffuse reflector which provided some "fill light" which helped to illuminate the shadowed areas of the LM. Photo 5863  My enhanced version of the above photo. 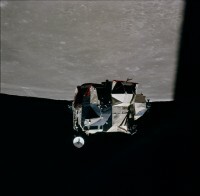 The white round thing to the left of the window is the LM's docking lamp. 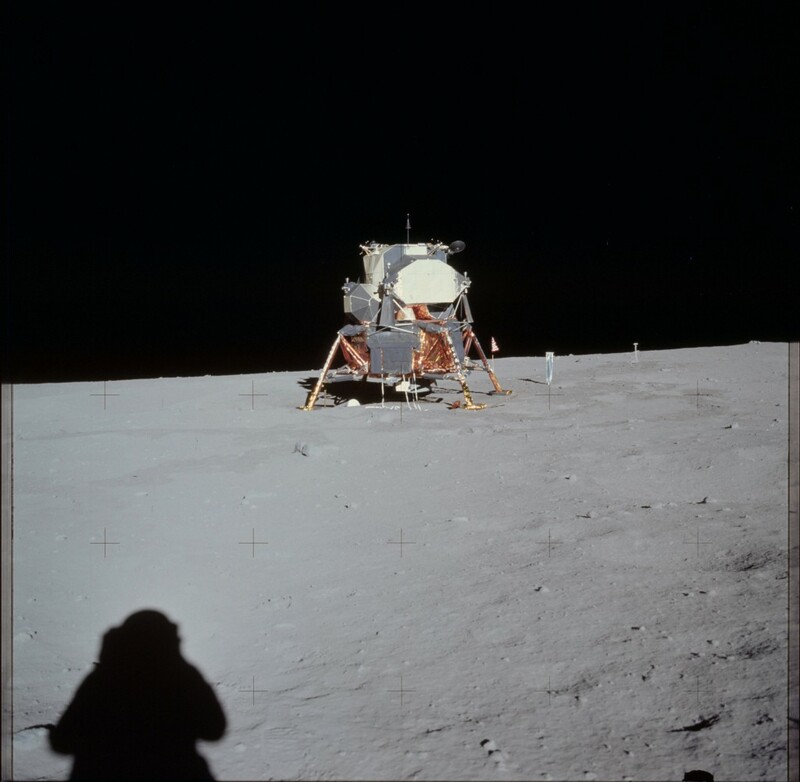 In this photo Armstrong has backed away from the LM enough such that the LM's window really is reflecting the distant lunar surface. The reason for the blue surface reflection likely is that blue light reflects more strongly off of glass when striking glass at an angle. 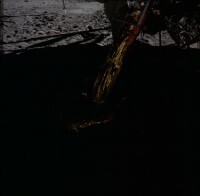 Photo 5864  Photo of the blast crater underneath the Apollo 11 LM descent stage. Photo has been color corrected, sharpened, film grain noise removed, and had the brightness levels adjusted to render the upper left corner space background nearly black. 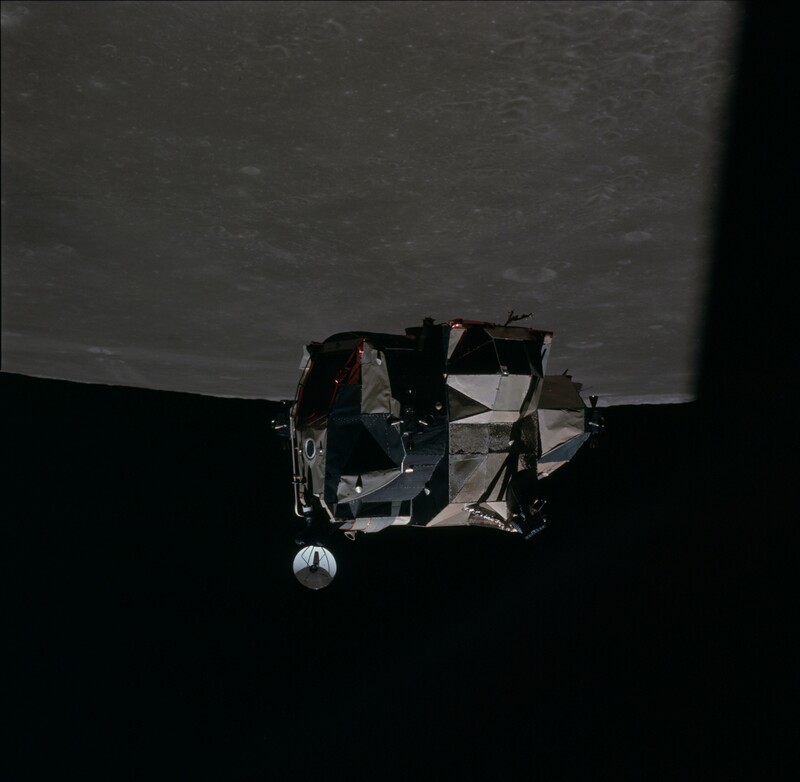 Armstrong must have been getting a bit impatient for Aldrin to wriggle through the LM hatch and get ready to descend the LM's ladder, so Armstrong passed the time by snapping this and the following photo before returning his attention to Aldrin. Photo 5865  Raw, color corrected image, looking east, of terrain under and southwest of the LM. 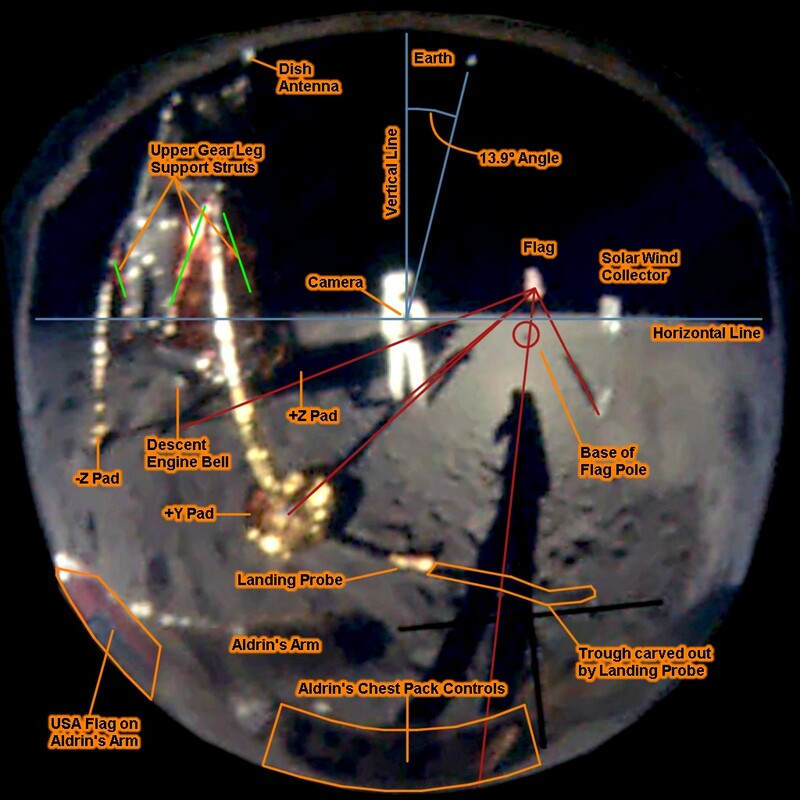 Looking at the curvatures of the -Y strut and probe, one can see that a shallow blast crater is present underneath the LM descent stage. 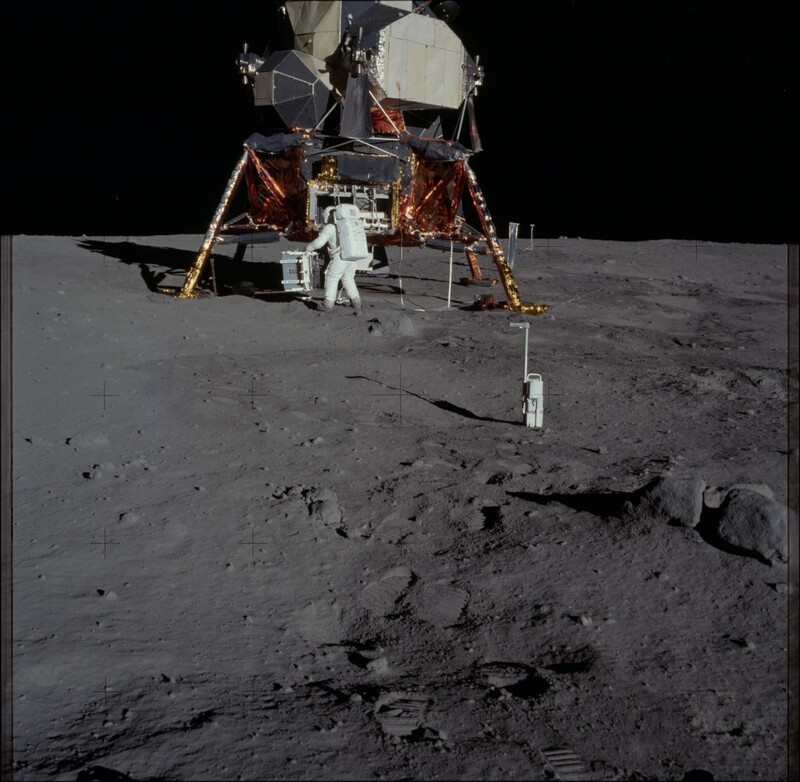 Note that some, but definitely not all, of this blast crater underneath the LM probably is due to the inherent terrain which was present at the Apollo 11 landing site. Photo 5865  Enhanced version of above image. 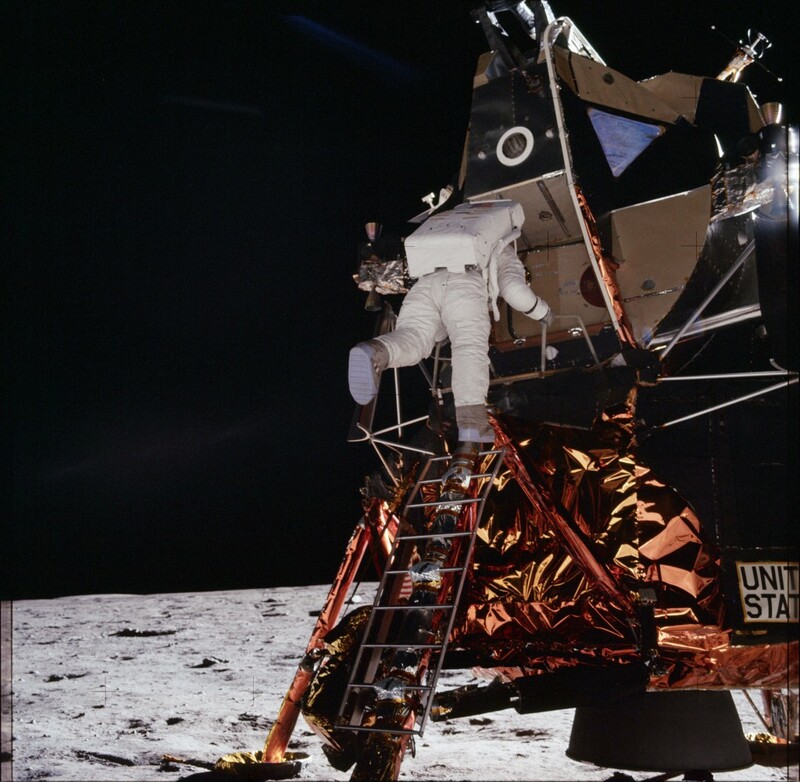 Photo 5866  Aldrin stepping down onto the top of the ladder. Photo has been color balanced. Photo 5866  Same as above photo, but here I have boosted the gamma in order to create an aesthetically pleasing version of the original photo. No, that is not a shadow being cast onto the LM airlock door (see further below). 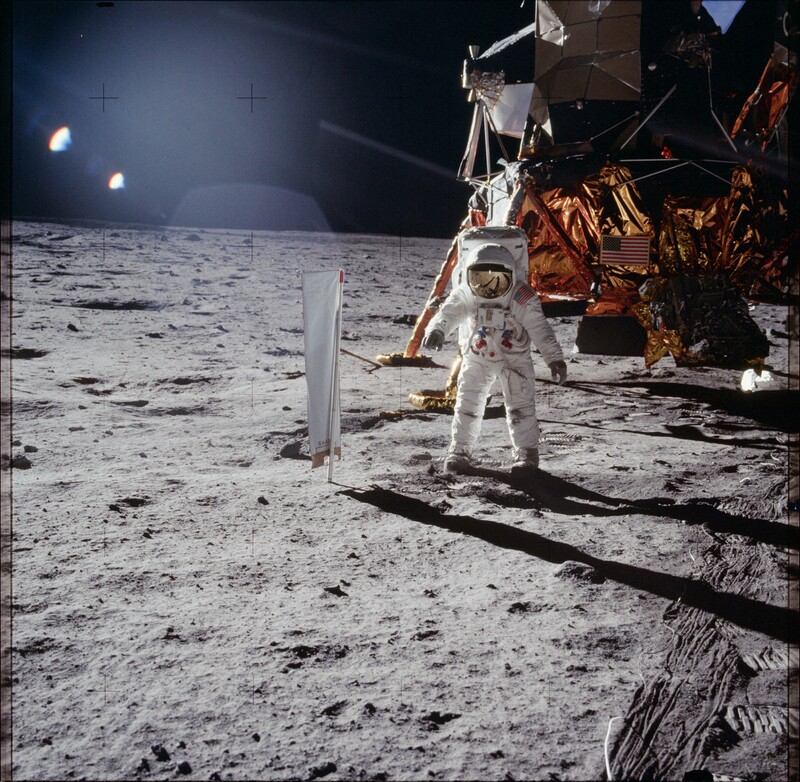 As you can see, the only light sources illuminating the LM and Aldrin are reflections from the surrounding lunar surface and from Armstrong's bright white space suit since Armstrong was standing in full sunlight when this photo and the previous photo was taken. Photo 5866  This photo version was strongly gamma corrected in order to show additional details within shadow areas in the original photo. Photo 6642 LM Hatch Close-Up View  Guess what? 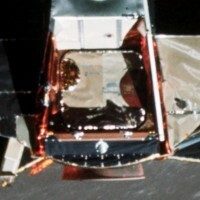 The hatch panel really does have distinctly different colored left and right halves, as seen in this LM hatch close-up view of the Eagle in lunar orbit. Photo 5867  Aldrin descending the LM's ladder. Photo 5867  My enhanced version of the above photo. I adjusted the exposure value so that the photo no longer appears to be underexposed, removed image noise, and then sharpened the photo. 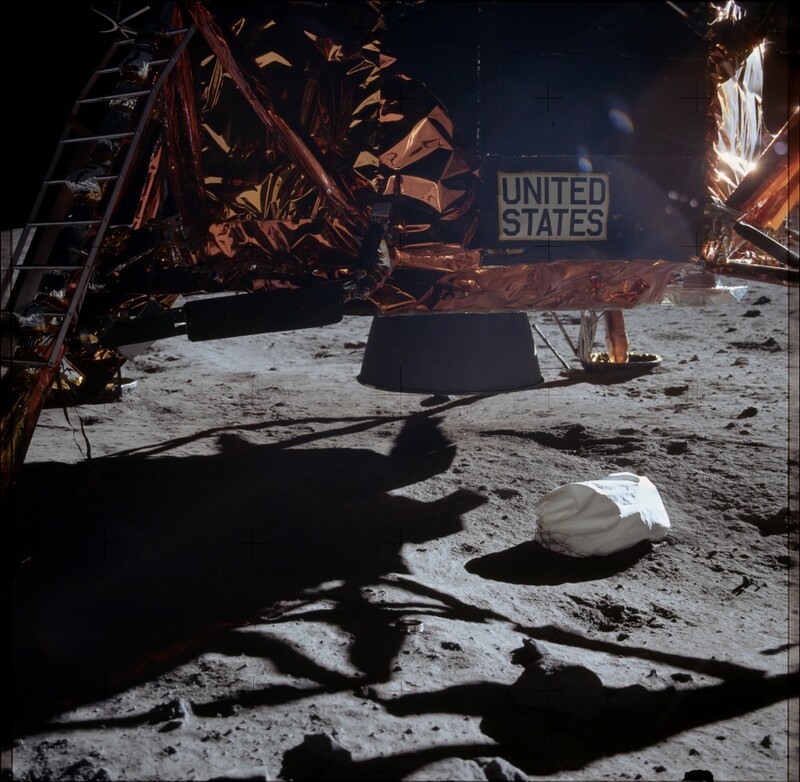 I could have boosted the gamma, as I did for image 5866 above, but instead I preferred to show the correct brightness range between deep shadows on the LM, the rest of the LM and Aldrin's space suit, and the lunar surface. 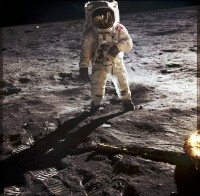 It is obvious that Aldrin is back illuminated by the lunar surface, and side illuminated by bright reflections off of Armstrong's space suit since Armstrong was bathed in sunlight when this photo was taken. 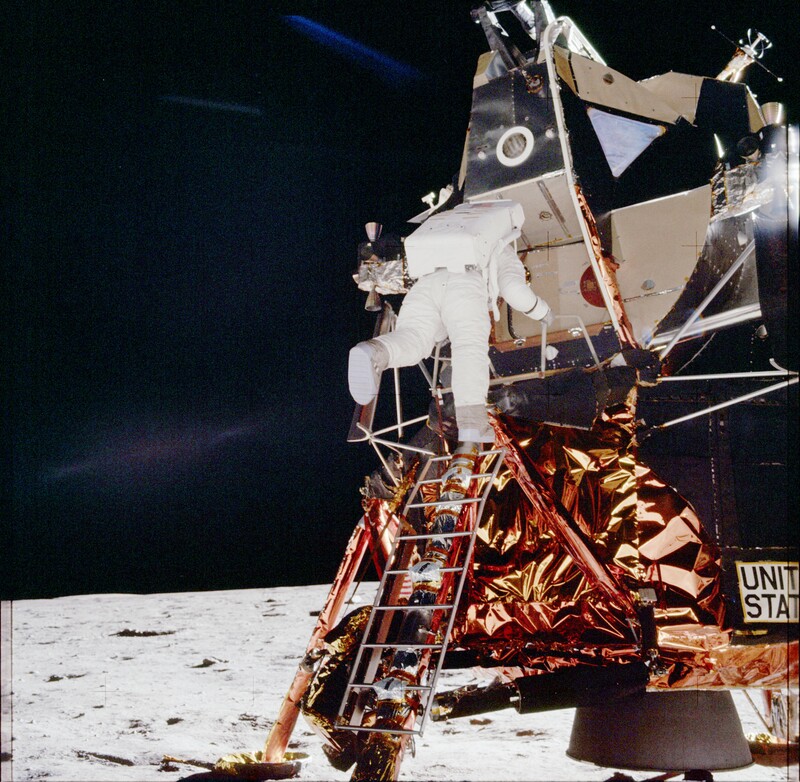 Photo 5868  Aldrin descending the LM's ladder. 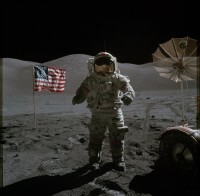 Photo has been color balanced, but no other image processing has been done. 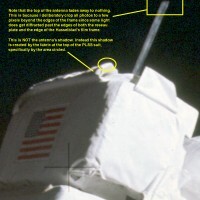 Yet this photo is exposed at 2 EV brighter than the above two photos. Armstrong apparently decided to quadruple the exposure time for this photo since the depth of field for this and the above two photos appears to be the same. 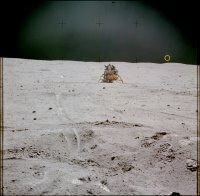 Judging by the lack of depth of field, I would guess that Armstrong already had the 60mm Biogon lens aperture set to its maximum F/5.6 aperture when this and the above photos of Aldrin descending the LM were taken. Photo 5872  Aldrin setting up the solar wind collector experiment. I applied a moderate hard light filter (to boost contrast) in addition to color balancing this photo since the sun's glare had somewhat fogged the photo, causing a general reduction in contrast throughout the entire photo. 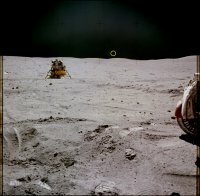 Bluish colored rock in above photo 5872  This rock, visible foreground left of Aldrin in photo 5872, caught my attention since it has a distinctly bluish hue compared to the surrounding lunar surface. 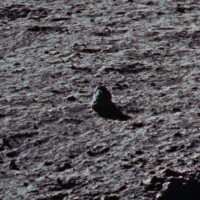 I wonder if this particular rock was collected by Armstrong and Aldrin during their brief EVA. 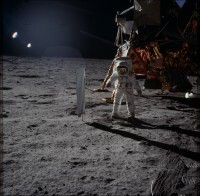 Photo 5873  Portrait of Aldrin standing next to the solar wind collector experiment. Photo has been color balanced. Photo 5873  Above photo, but with strong gamma applied to bring out shadow details. 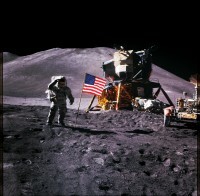 Photo 5874  Aldrin posing next to and saluting the USA flag. Photo 5874  My enhanced version of the above photo. Close-up view of Aldrin saluting the USA flag. Photo 5875  Aldrin posing next to the USA flag, but in this photo Aldrin has finished saluting the USA flag and has turned his head to look at Armstrong. Note that you can clearly see Aldrin's face through his visor. 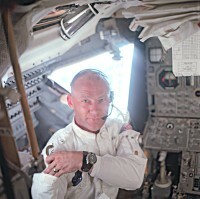 I'm not sure, but it looks like Aldrin is grinning from cheek to cheek. If I was standing in his shoes then I would have been grinning like a maniac too. 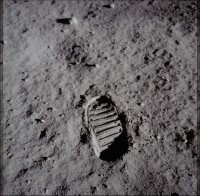 After all, what are the odds of you and one other person being the first two people to set foot upon and walk on the moon? 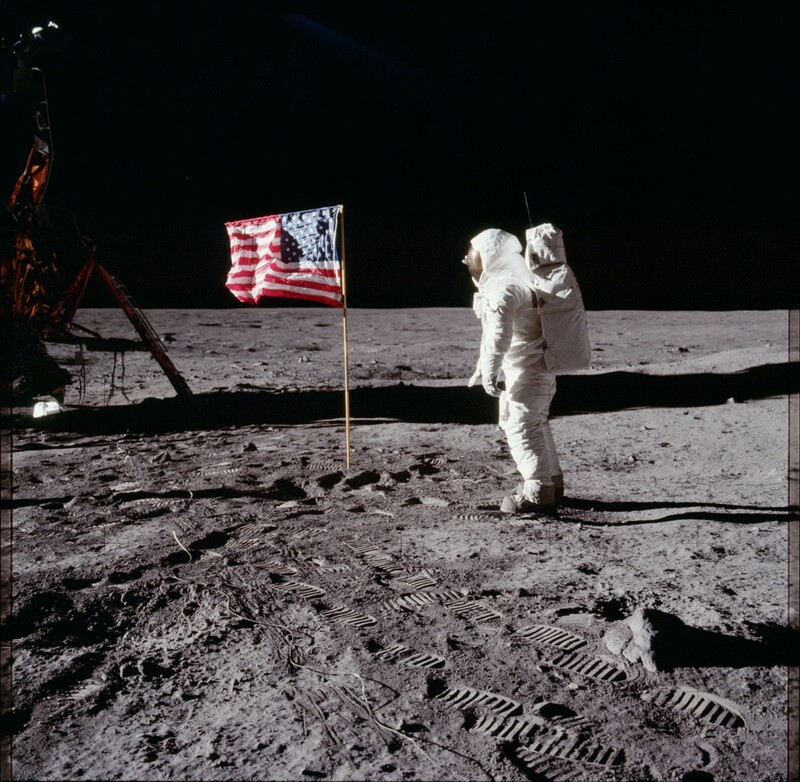 Obviously the feelings experienced by Aldrin and Armstrong were way better than winning any lottery. Photo 5875  My enhanced version of the above photo. Close-up view of Aldrin after he has saluted the USA flag. Photo 5877  This photo, along with photo 5903 below, probably are the most recognizable photographs ever taken in human history. Contrary to popular belief, this is not Armstrong's first step on the moon. It was taken after Aldrin already was on the lunar surface. 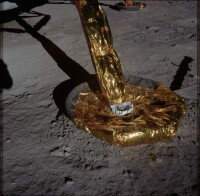 Neil photographed this patch of lunar surface just before he took this photograph after making this footprint. 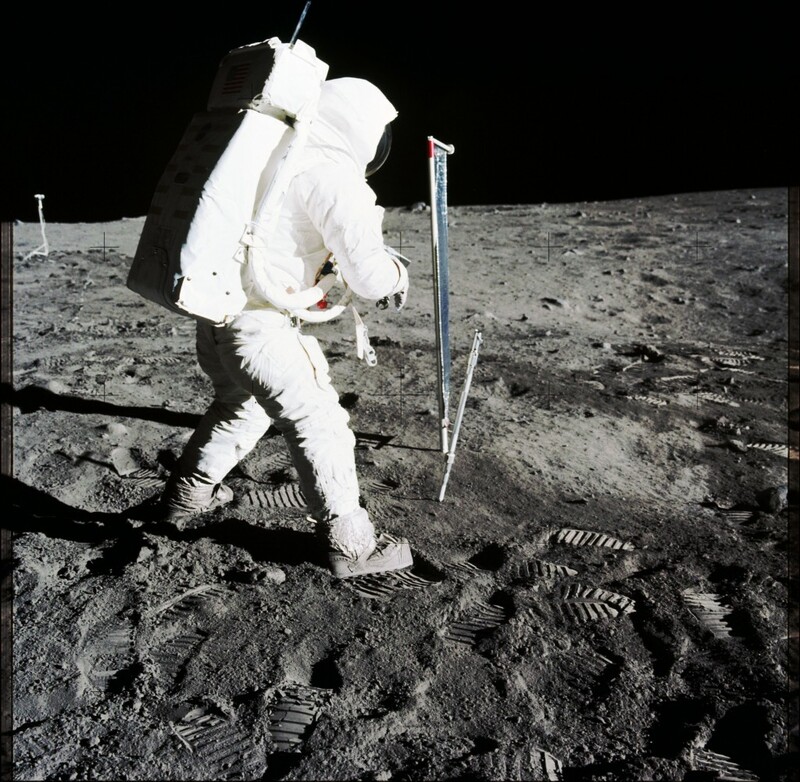 Obviously his intention was to show scientists how much the soil compresses when stepped on. 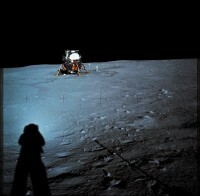 I wonder if Armstrong knew just how famous this photograph would become when he took this photo. Photo 5882  This photo nicely shows the Heiligenschein (German for "aureole" or "halo", literally "Holy shine") which is an optical phenomenon that creates a bright spot around the shadow of the viewer's head. 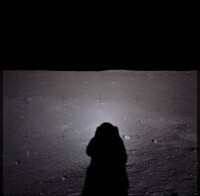 It is created when the surface on which the shadow falls has special optical characteristics. The special optical characteristics of the lunar surface which produces this Heiligenschein phenomenon are created by the very tiny glass beads within the lunar soil. These glass beads are created by millions of years of micrometeorite impacts. Photo 5882  Above photo, but enhanced in order to bring out terrain details. It is interesting to see that the entire lunar surface is strewn with boulders. Also note that most of the large boulders tend to have a bluish hue compared to the surrounding soil. Photo 5892  View underneath the LM Eagle. Photo 5892  Enhanced version of above photo. 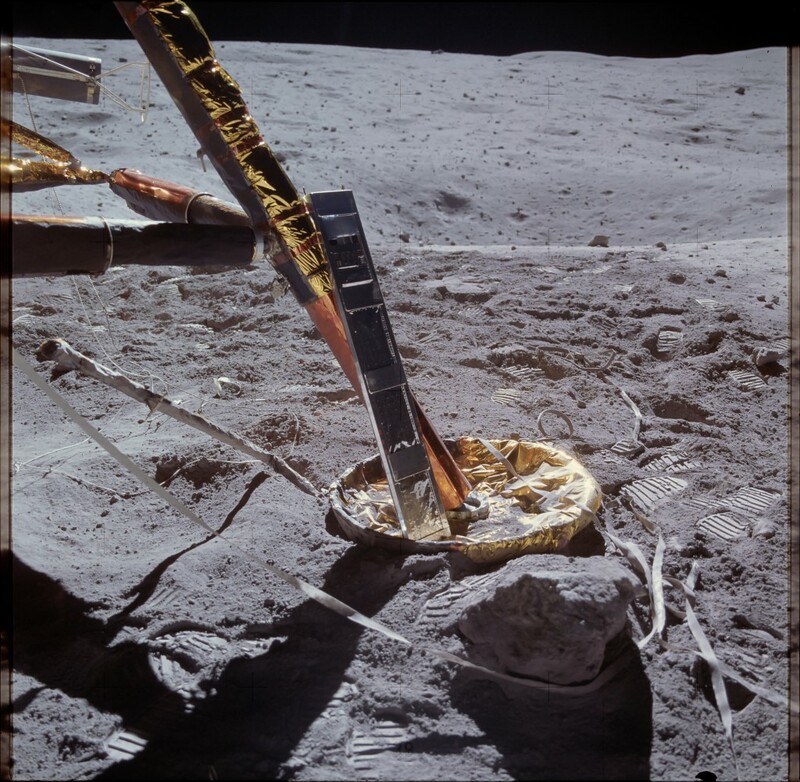 Note the missing lunar topsoil as well as the surface scarring underneath the LM's descent engine. Photo 5895  View of the Eagle's +Z footpad. The Eagle's +Z lander leg and footpad is famous since this is the leg and footpad which Armstrong stepped off of in order to be the first human being to set foot upon the moon's surface on July 20, 1969. This is ISD's raw image which only has been color balanced. 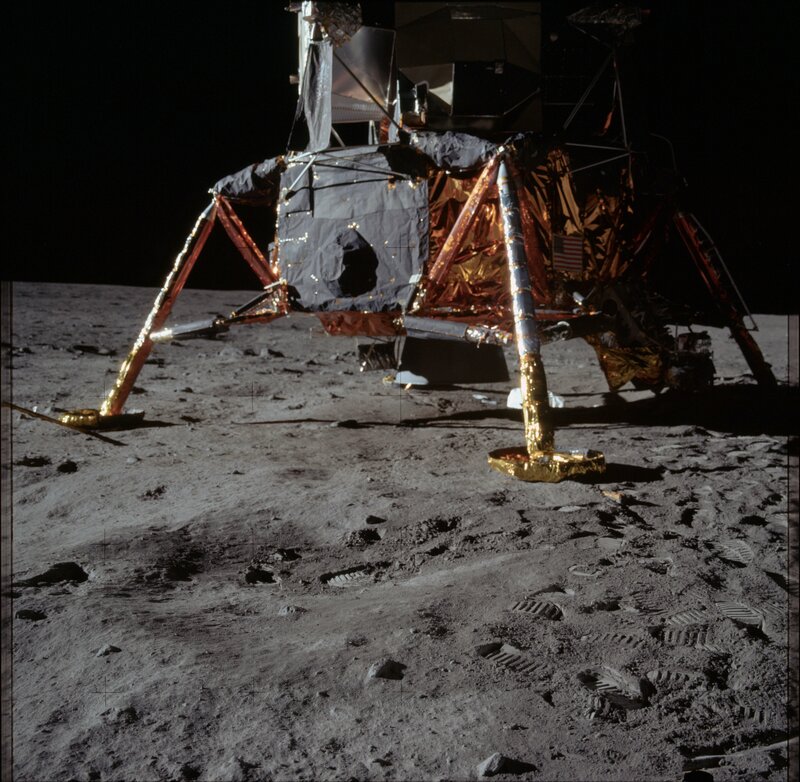 This photo is very dark since Armstrong forgot to increase the exposure value (EV) by either opening up the aperture, increasing the exposure time, or both. 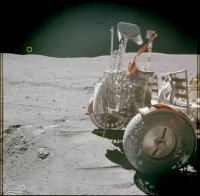 Judging by the very limited depth of field, it appears that the 60mm Biogon lens already was set to its largest or maximum aperture of F/5.6. Photo 5895  Above photo after applying strong gamma correction and a noise filter. I thought that this enhanced version of the above photo was worth including on this web page since perhaps some of the Grumman engineers are still alive and will recall wrapping this very lander strut and footpad with the multiple layers of insulating Mylar foil. 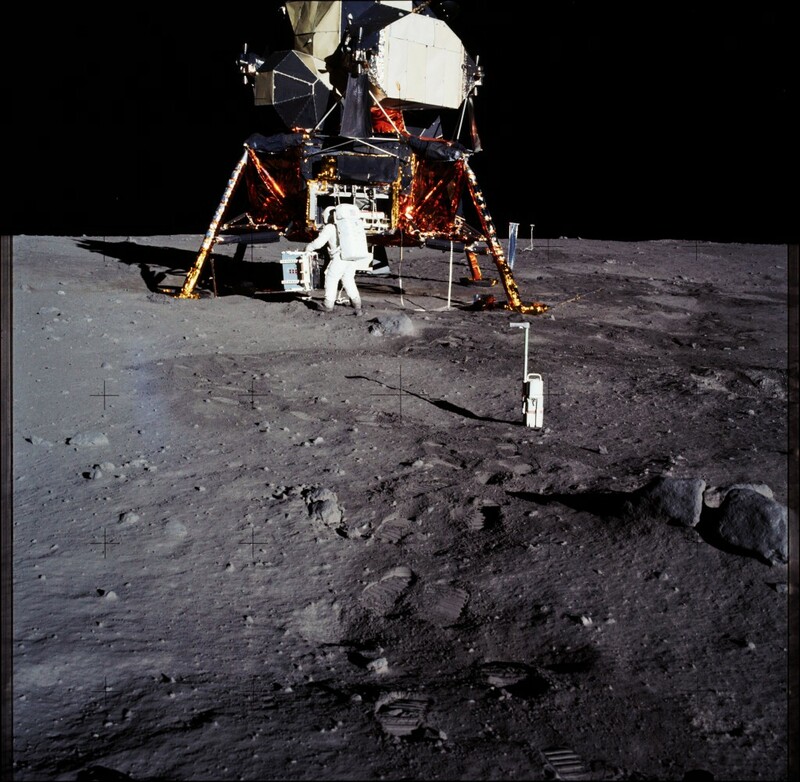 The noise filter blurs extremely bright areas when it is adjusted to remove noise from extremely dark areas. 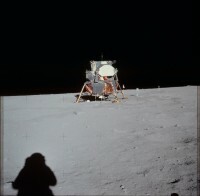 Aldrin can be seen at the top of the photo standing next to the LM's MESA. 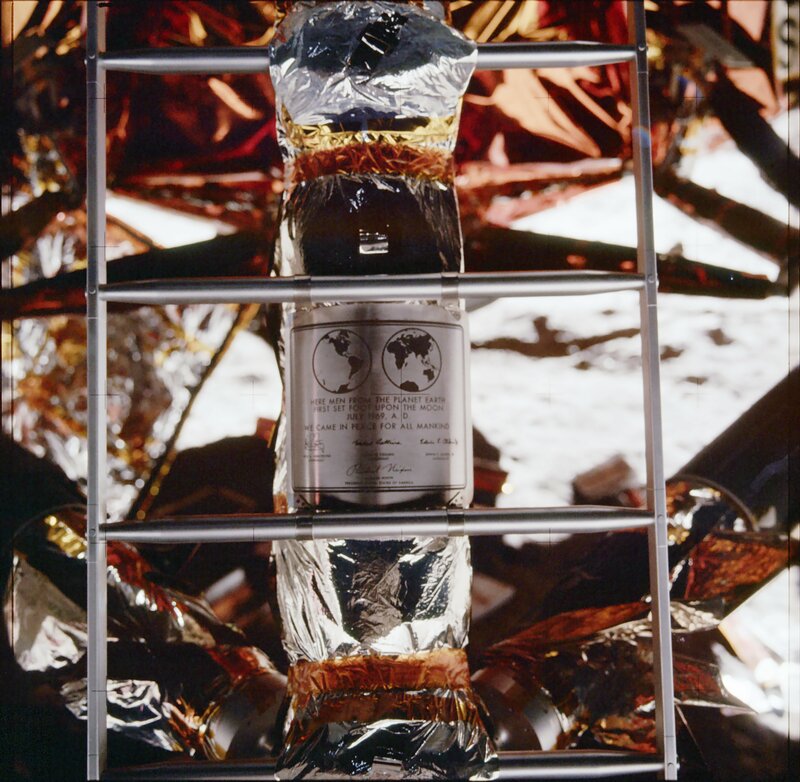 Note that the solar wind collector experiment already has been deployed by Armstrong. 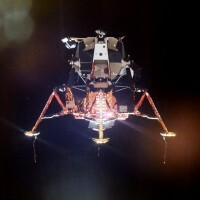 Photo 5899  The famous photo of the plaque attached to the LM's landing gear. Photo 5899  My enhanced version of left photo. Photo 5902  Buzz Aldrin on the moon, just after he finished descending the LM ladder and stepping off the footpad. 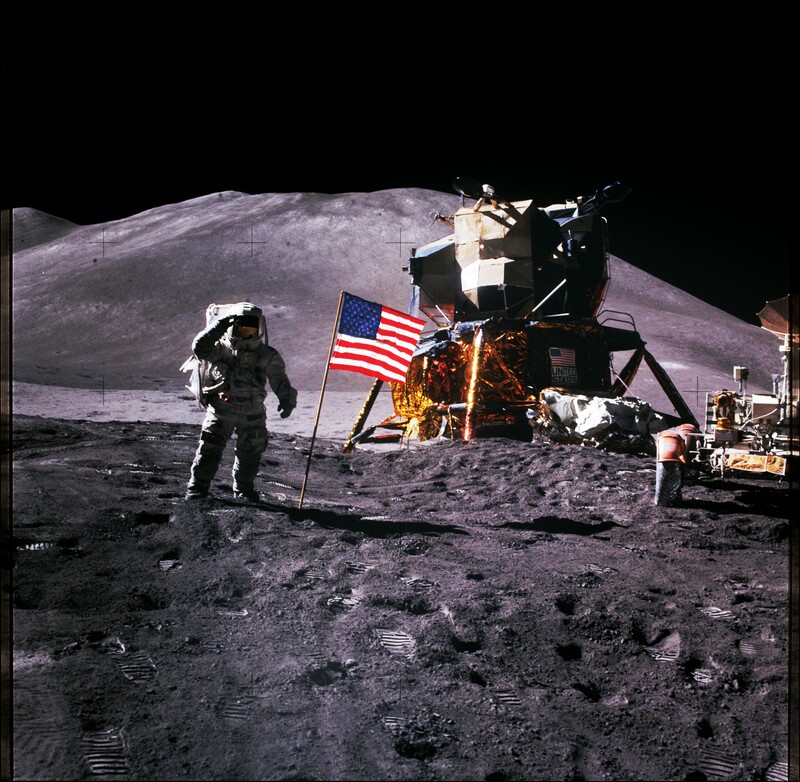 This photo has been color balanced and has had vignetting removed. Note the LM descent engine's blast trail which sweeps from left to right and just behind Aldrin in this photo. Photo 5902  Enhanced version of above photo. The "Man On The Moon" Photo 5903  Probably the most famous and most widely recognized photograph ever taken. Photo 5903 (original ISD scan, cropped)  This scan is the original ISD scan made from the actual Ektachrome transparency shot by Armstrong on the moon. 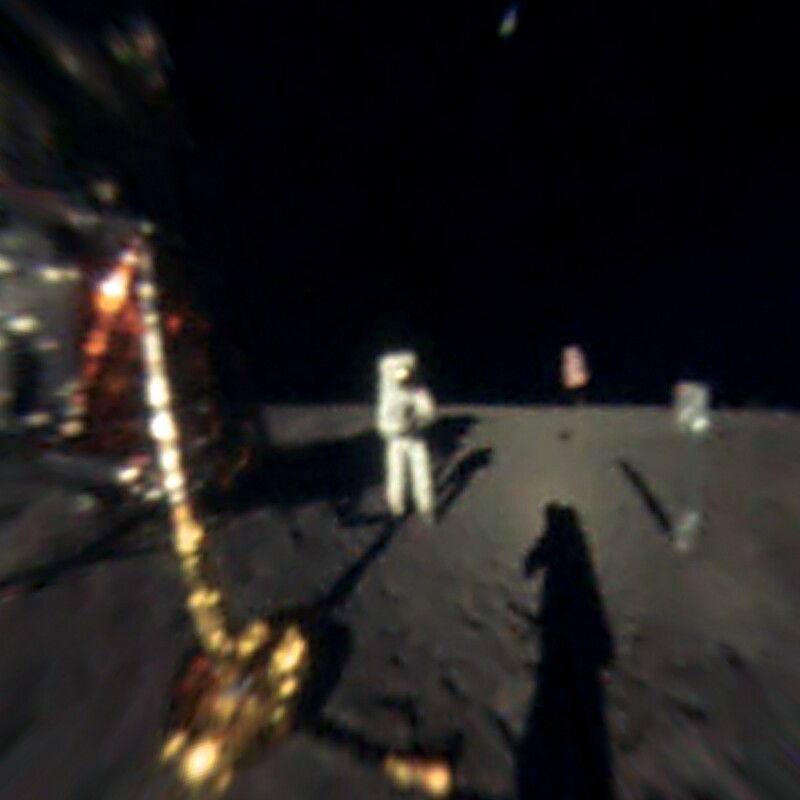 Photo 5903 (cropped, noise removed, color balanced, lens vignetting removed)  The famous "Man On The Moon" photo of Aldrin. 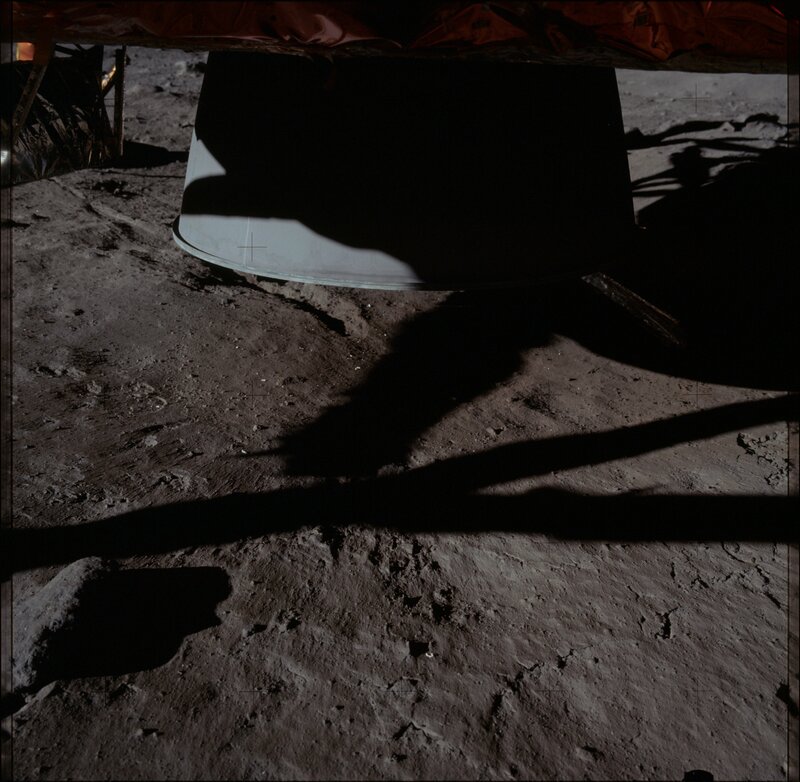 This is one photo where I removed the Biogon 60mm F/5.6 lens's inherent vignetting in order to show that the lunar surface was evenly illuminated by the sun. 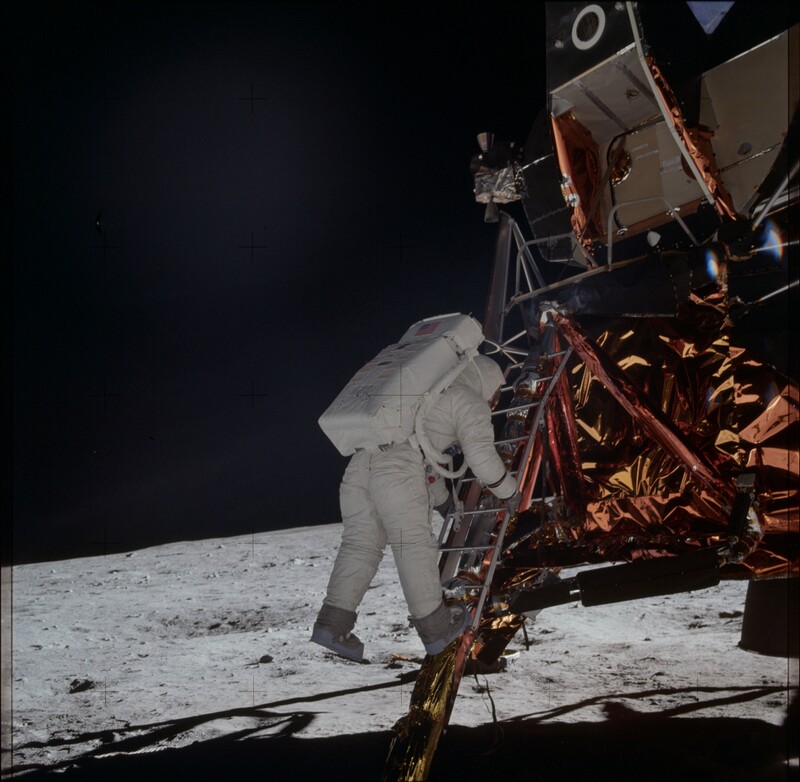 This photo is as close to a true view of what Armstrong saw, in terms of color, brightness and contrast, when he photographed Aldrin. Be sure to look closely at Aldrin's watch in the full resolution photo version and note that the watch shows 11:14 PM CDT. 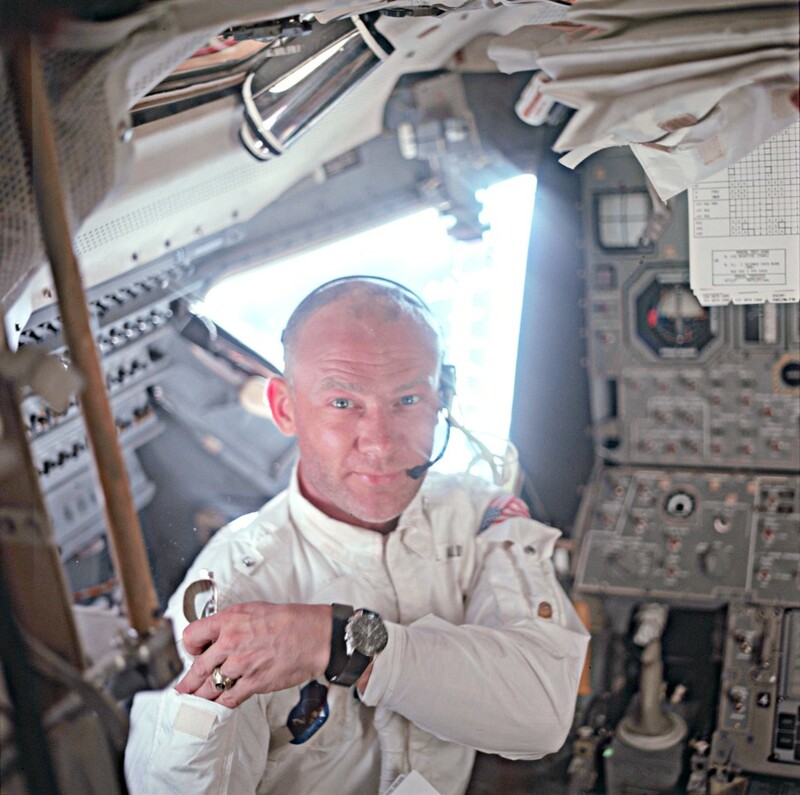 Aldrin had his watch set to Houston Texas CDT since this was the time used by mission control. 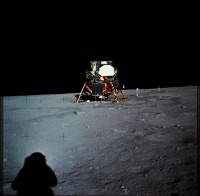 Thus photo 5903 was taken at 11:14 PM CDT on July 20, 1969, or 04:14 AM UT on July 21, 1969. 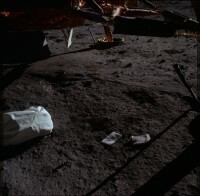 NASA's Apollo Lunar Surface Journal says that the photo was taken within 5 minutes of the time shown on Aldrin's watch. The brighter patch behind Aldrin definitely was caused by the LM's descent engine. See enhanced versions of photos 5902 above, 5963 and 5964 further below, which show the same bright descent engine blast pattern. In any event, technically this photo is perfectly exposed since the brightest portions of Aldrin's suit just come close to reaching fully saturation and since there still are extremely faint details present in the deep shadow areas. I am still working on calculating the perspective distortion for photo 5903 since Armstrong tilted the Hasselblad camera with its 60mm Biogon lens approximately 20 degrees down relative to the horizon in order to take photo 5903. 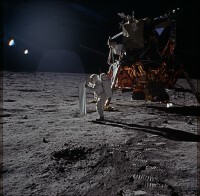 A lot of that tilt was due to the natural "lean forward" stance position needed to counter the weight of the personal life support system (PLSS) backpack. 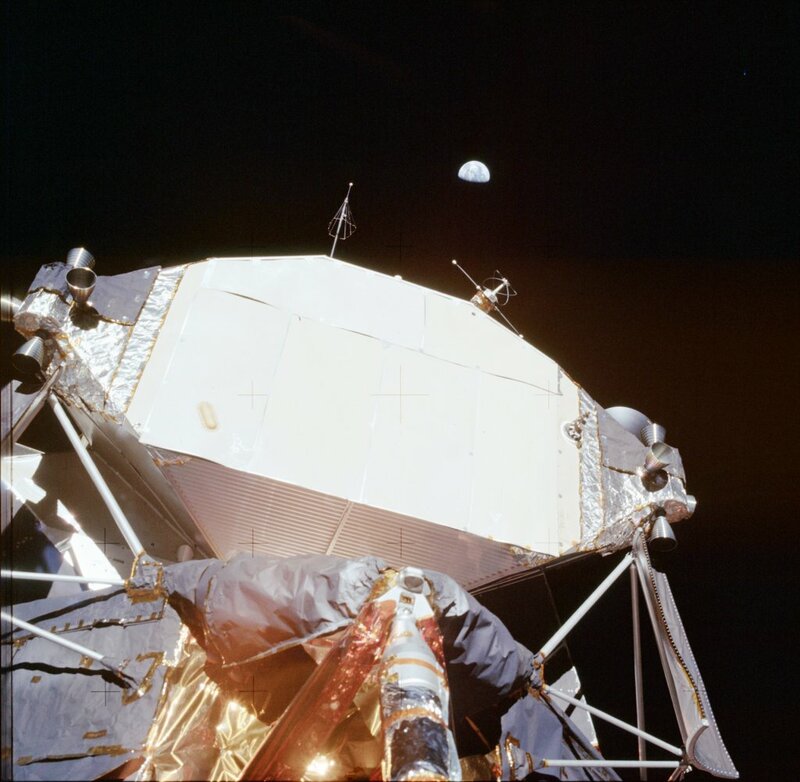 Armstrong also had the presence of mind to rotate the camera clockwise since he figured that if he didn't, then the sun's glare would be in the upper right of the frame and would completely wash out the photo. He probably also figured on getting a fair amount of the extremely bright gold colored Mylar covered landing pad and strut out of the photo as well. 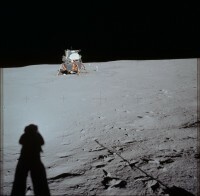 Or perhaps Armstrong just got lucky when he took this photo! Aldrin admits that Armstrong was a far better photographer than he was. 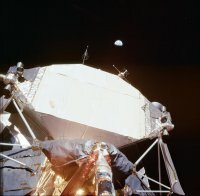 This likely is why the majority of the Apollo 11 EVA photos were taken by Armstrong. Armstrong also had an uncanny knack for getting the exposures right. 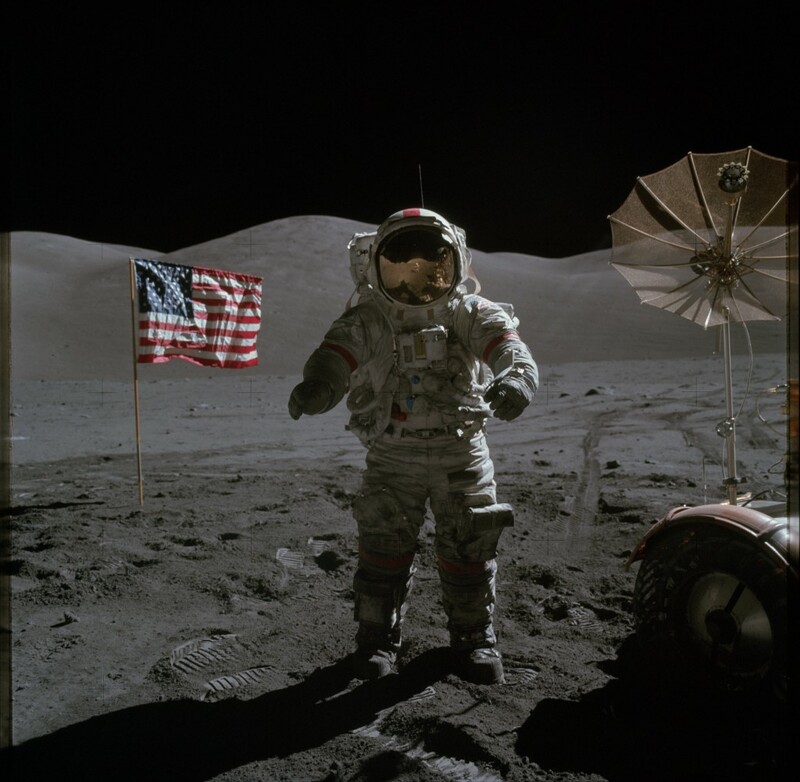 In all of his photos the brightest whites in the scenes come really close yet don't oversaturate the film. Apparently Armstrong took his assignment really seriously when NASA told the astronauts to take the camera equipment home with them and shoot tons of photos in order to gain experience using the camera gear. How high was the sun above the horizon when photo 5903 was taken?  At the Apollo 11 landing site on July 21, 1969 at 04:14UT when this photo was taken, the sun was at an altitude of approximately 14.75 degrees above the horizon. The screen shot at left is from a program called Celestia. 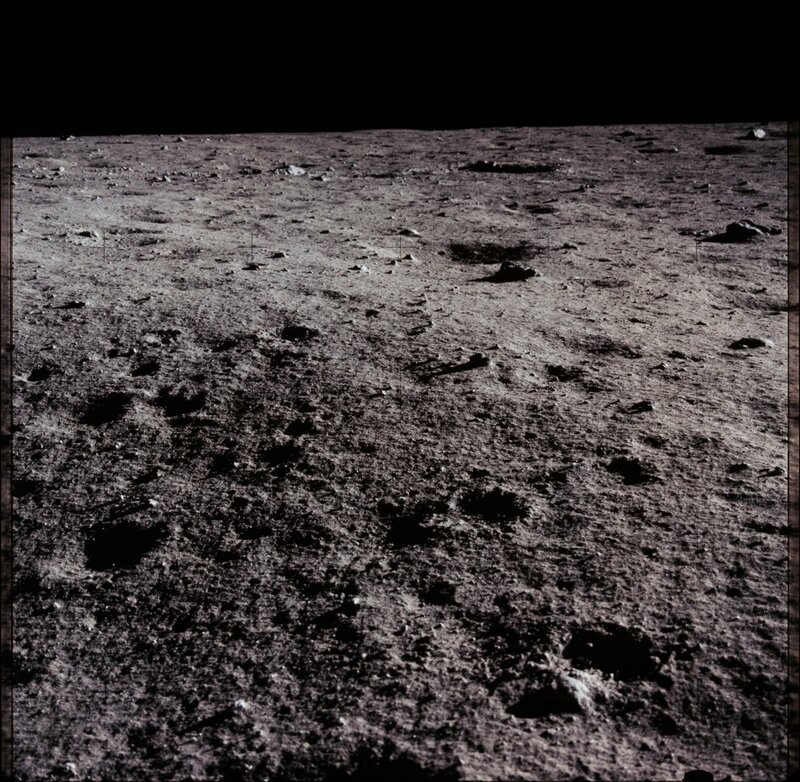 It is a view from the Apollo 11 landing site on the lunar surface on July 21, 1969 at 04:14UT. Photo 5903 with lognormal curves applied This version of the above famous 5903 photo should dispel all Apollo hoax conspiracy claims that a second light source was present in the photo. As you can clearly see, the only illumination of Aldrin is the sun itself, the gold and bronze colored Mylar covering the LM struts and descent stage, the moon surface itself, and reflections off of Armstrong's white space suit. Not convinced? Examine the close-up views of Aldrin's visor reflection, further below, to see all of the bright objects which illuminated the shadow side of Aldrin's spacesuit. 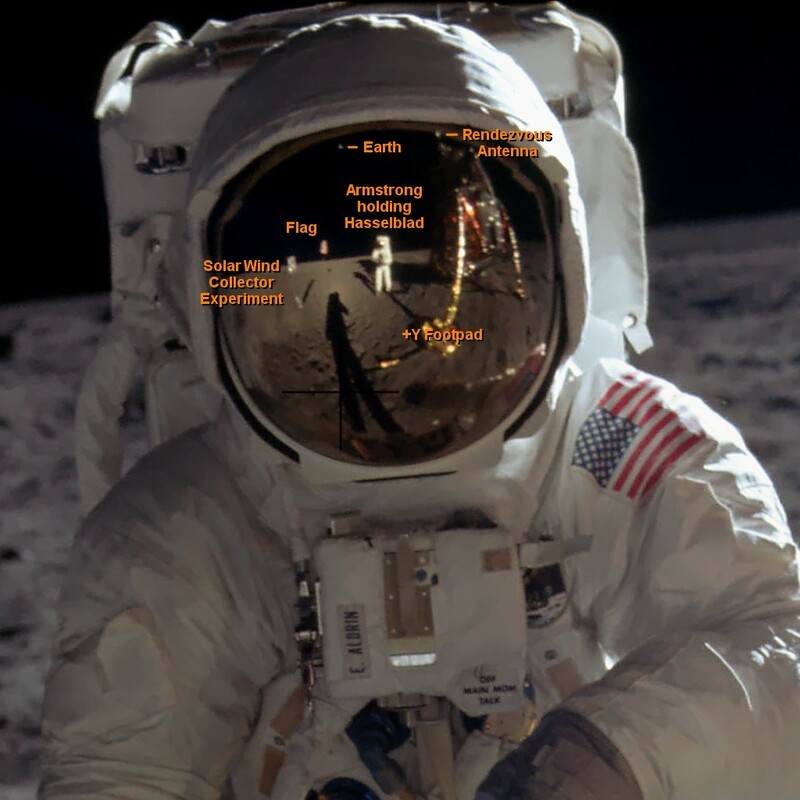 Portrait of Buzz Aldrin or an annotated version  A close-up of Aldrin taken from the above photo. 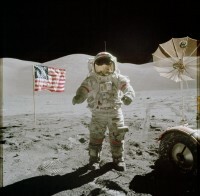 The background was slightly darkened to remove glare caused by the sun and make the sky black. Visor close-up from photo 5903  Here I have removed the visor's gold tint and rotated the view to make the horizon horizontal. Note that the apparent visible phase of the Earth is misleading since the Earth's reflection from near the edge of the visor is greatly distorted by the spherically shaped visor. If you look closely at the image, it appears that the Biogon lens has some slight inherent on-axis astigmatism. 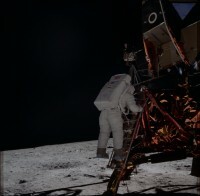 This instead may have been caused by Armstrong not holding the camera quite steady enough for the given the exposure time, or by Aldrin slightly moving during the exposure. 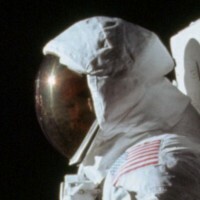 Mirrored, strongly enhanced and labeled visor close-up from photo 5903  This particular image is extremely important due to what image information is truly shown in the reflection off of Aldrin's visor. 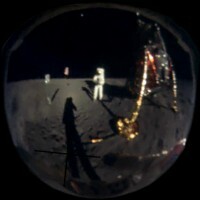 This photo is mirrored compared to the above photo in order to show what Aldrin saw through his visor. First, note that the Earth is offset to the right at a 13.9 degree angle relative to the camera and vertical. Second, this image allows us to determine exactly where Aldrin was standing relative to the LM, based on his position relative to the horizontally bent +Y pad landing probe, based on the reflected perspective for the upper support struts for the +Y main strut, and based on how much of the nearer upper -Z strut which is visible and not occluded by the side of the LM descent stage. I have drawn in burgundy colored lines from the bases of various objects in order to establish the vanishing point for all of the shadows. I also circled the flag's shadow in burgundy. 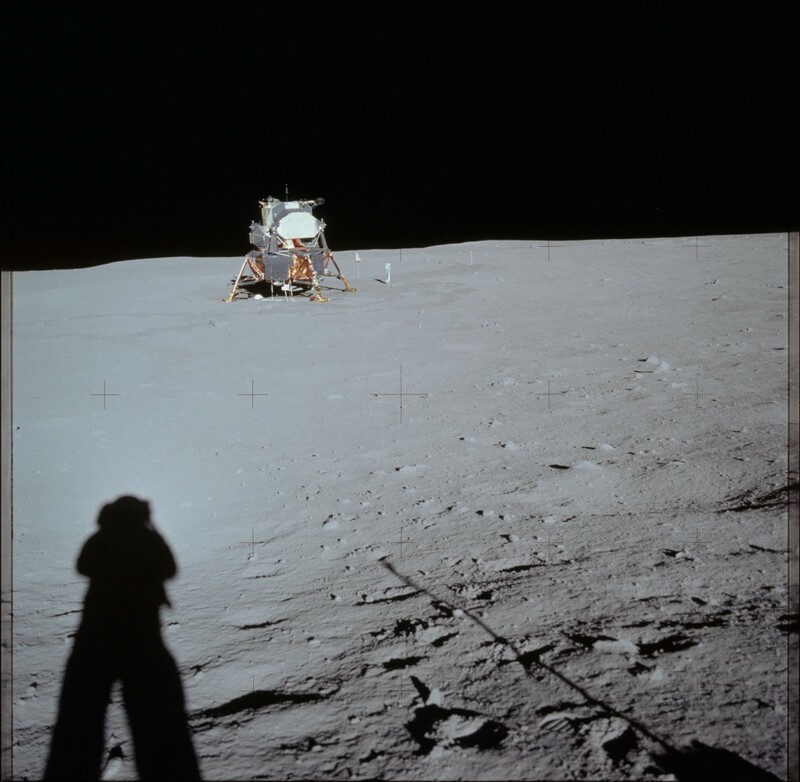 It is obvious that the ground upon which the LM was sitting sloped up towards the western horizon since the vanishing point for the shadows is above the horizon. In particular, also note where the shadow of the top of the LM and Dish antenna hit the ground just to the right of Armstrong's elbow. 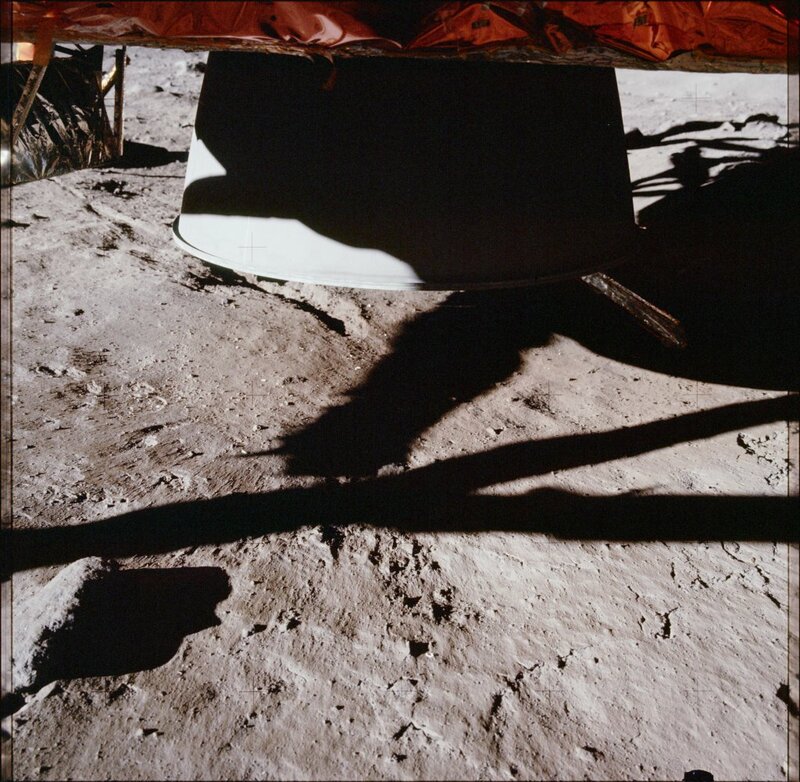 The fact that the top of the LM's shadow is foreshortened also indicates that the ground further west from the LM progressively slopes up further away from the LM. Another indication that the ground slopes up towards the west horizon is provided by the length of Aldrin's shadow. Since the sun was at an altitude of 14.8 degrees when this photo was taken, we can calculate that Aldrin's shadow should have been nearly 25 feet long, assuming that the space suits were 6-1/2 feet tall. Thus the end of Aldrin's shadow, if the ground surrounding the LM and under the LM was level, should have fallen further back from the base of the solar wind particle collector pole if the ground was perfectly level. Photo 5903 (Aldrin's Visor View, distortion corrected)  My processed and distortion corrected view of the reflection in Aldrin's visor in the above 5903 photo. I have mirrored this image left-to-right in order to show what Aldrin saw from inside his visor when Armstrong shot the famous 5903 "Man On The Moon" photo. 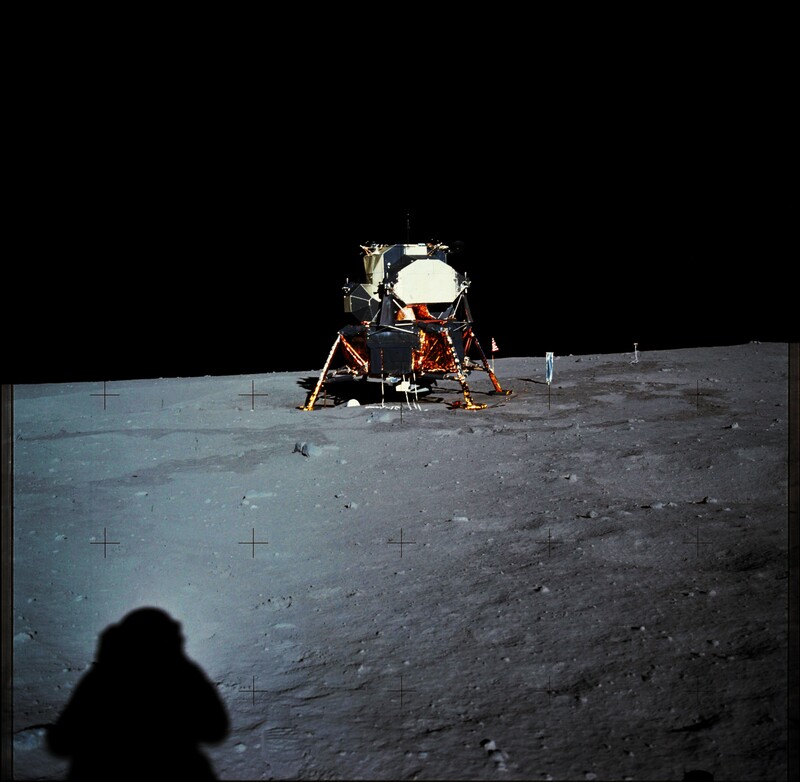 Yes, that is indeed the Earth above and somewhat to the right of Armstrong. 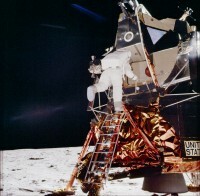 You can also see that Armstrong had his gold colored visor pulled down when he shot the famous 5903 photo of Aldrin. 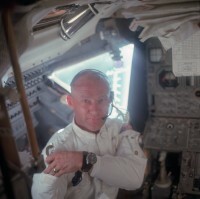 So, just where was the Earth in the moon's sky above Aldrin's head?  Celestia gives us this answer. 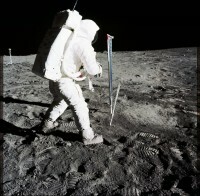 The Earth was at an altitude of almost exactly 59 degrees above the western lunar horizon on a bearing of 273 degrees along the western lunar horizon. 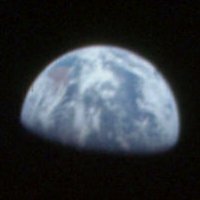 The real kicker is when you compare a close-up of Celestia's representation of the Earth and its phase to the close-up of the Earth in photo 5924 further below. 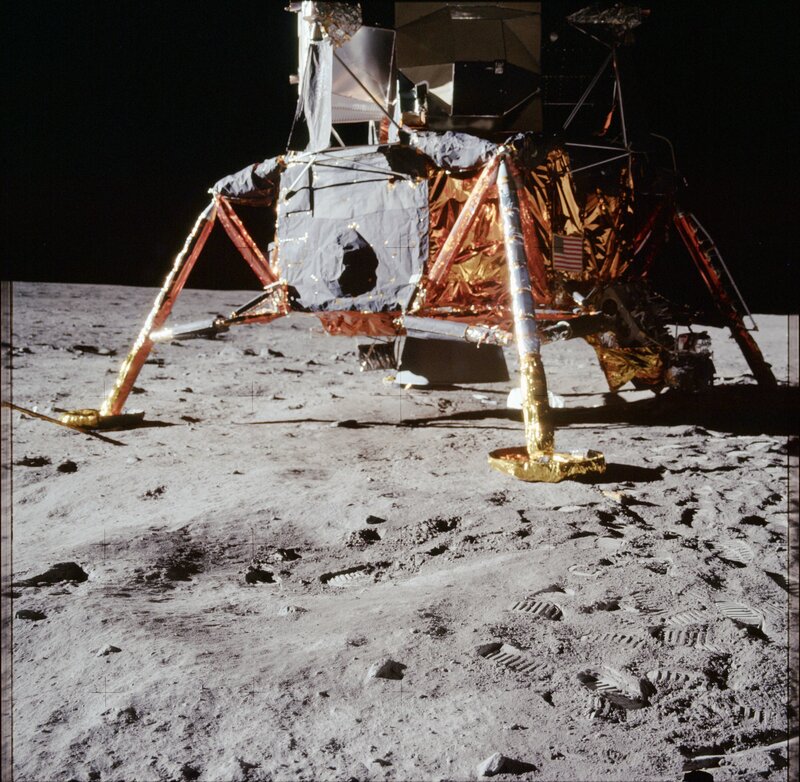 Armstrong-Aldrin position angle (bearing) at which 5903 was taken  This is only a preliminary result which assumes that the west lunar horizon, although elevated, is level. It probably was not. 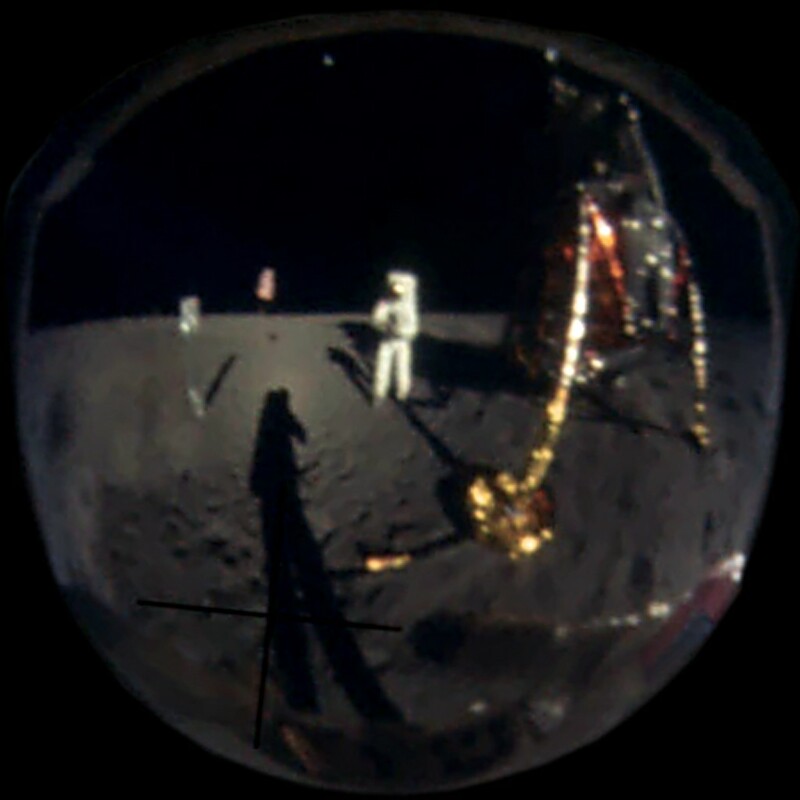 In order to figure out the bearing, you have to mentally draw a line from the camera on Armstrong's chest to its reflection off of Aldrin's spherically shaped visor. 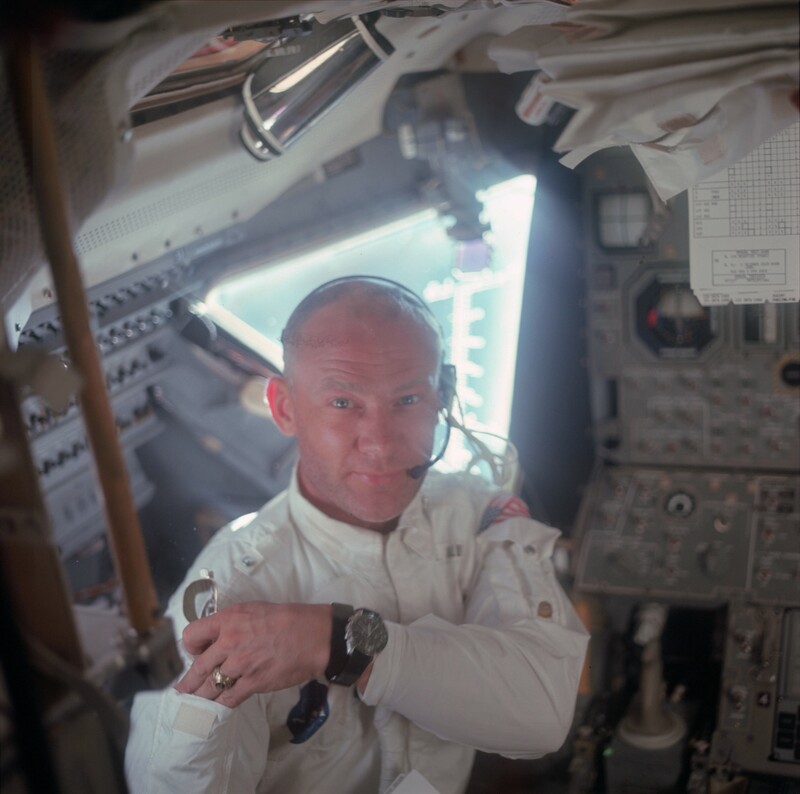 You also have to realize that the exact point on the surface of Aldrin's visor is the point on the visor which is closest to the camera. Eventually I will create a CAD model to visually show this concept. In any event, assuming that the west horizon was level and based on the above measured position angle of the Earth in the visor sky (an angle of 13.9 degrees), I zoomed out as far as I could in Celestia and through several iterations of tweaking the direction along the horizon at which I was looking, I found that a bearing of 248 degrees produces the correct 13.9 degree offset for the Earth relative to the zenith. 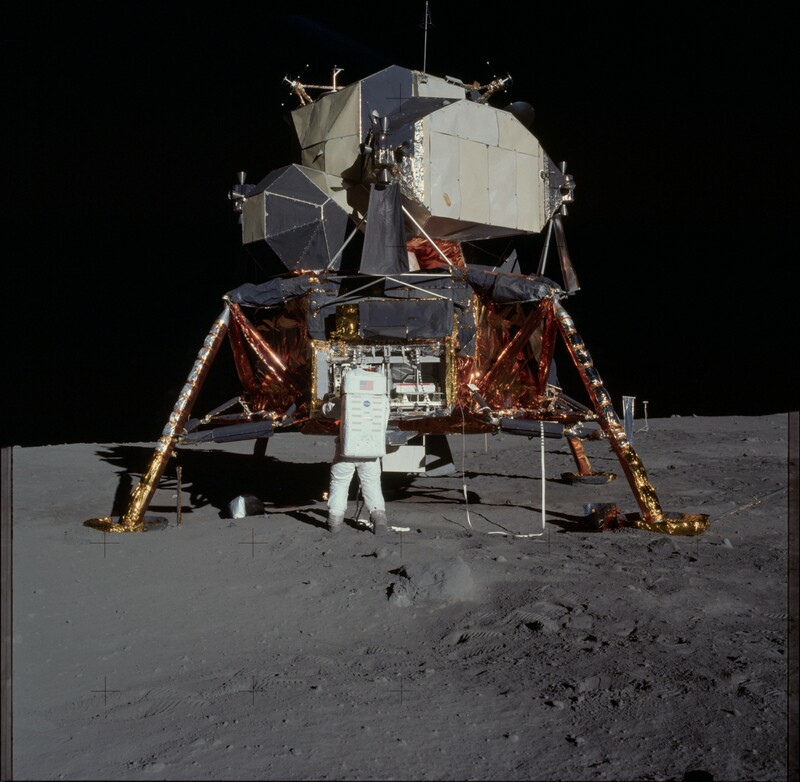 Thus Aldrin was standing on a bearing, relative to Armstrong's position, of 68 degrees east relative to lunar north, and of course Armstrong was standing on a bearing of 248 degrees relative to Aldrin. Exact sun altitude and azimuth when 5903 was taken  As you can see, the sun was on a bearing of approximately 88.87 degrees relative to lunar north. 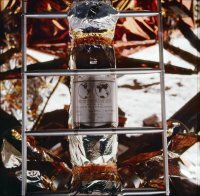 The sun's altitude was approximately 14.78 degrees. Call the azimuth 89 degrees. 89 degrees minus 68 degrees is 21 degrees. 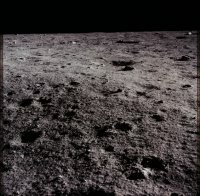 Thus, assuming that the west lunar horizon was level, photo 5903 was taken at a bearing of 21 degrees northward from the sun's position in the sky above the eastern lunar horizon. Photo 5910  Photo taken from Panorama Station 3 looking towards the north-northeast. Panorama Station 3 was located north of the LM roughly 17 meters away from the center of the LM. Photo 5910  Enhanced version of the above photo. Here I adjusted curves in order to boost contrast throughout the scene. The blast path as the LM skirted above the lunar surface is obvious in this photo, assuming that this is what this bright swath really is. This bright swath also has a different hue compared to the surrounding terrain. Keep in mind that the LM windows and astronauts were facing west or away from the sun or towards the left in this photo during the descent. 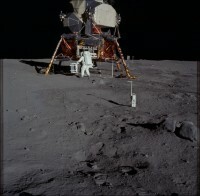 Apparently Armstrong "kicked it to the left" a bit in order to avoid the boulders in the distance? And then apparently Armstrong during the final few seconds kicked the LM forward (west) a couple of dozen feet in order to land in an area that he could clearly see was free of boulders since he and Aldrin had no way of seeing anything either behind or directly underneath the LM? Anyway, this is my hypothesis regarding the final 30 seconds of the LM descent profile. 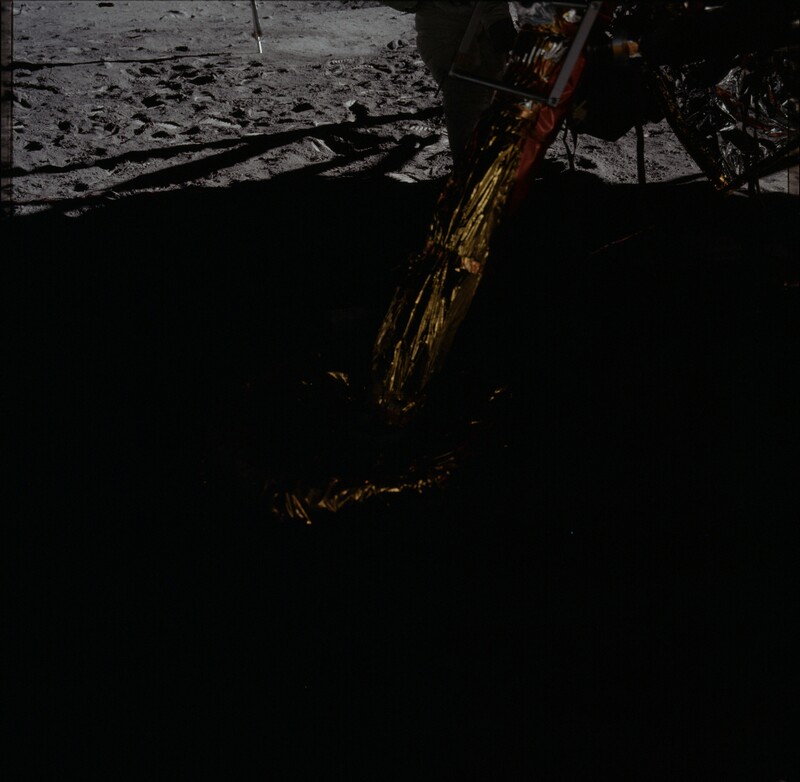 I wonder if Armstrong can confirm that he "kicked it forward" by several feet just before surface contact, just to make sure that he landed on a smooth spot that he could actually see through the LM window. Photo 5915  The LM on the lunar surface. That Biogon lens should have had some more tick marks for additional focus settings besides near, medium and distant. Note that the foreground is sharp (best focus) yet the LM itself is a bit soft (out of focus). The large shallow crater in the foreground is the crater which Aldrin was standing in when Armstrong shot the famous 5903 "Man On The Moon" photograph. Photo 5915  My enhanced version of the above photo. 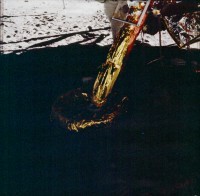 Photo 5921  View of lunar surface underneath the LM's descent engine. Yes, you can clearly see radial blast patterns created by the descent engine. 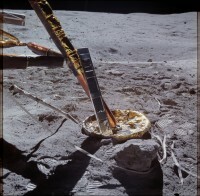 You will also note that the newly exposed lunar soil, exposed by the engine blast, has a somewhat brownish color. 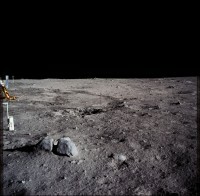 See my following enhanced photo for a better view of the blast patterns and the exposed soil hues. 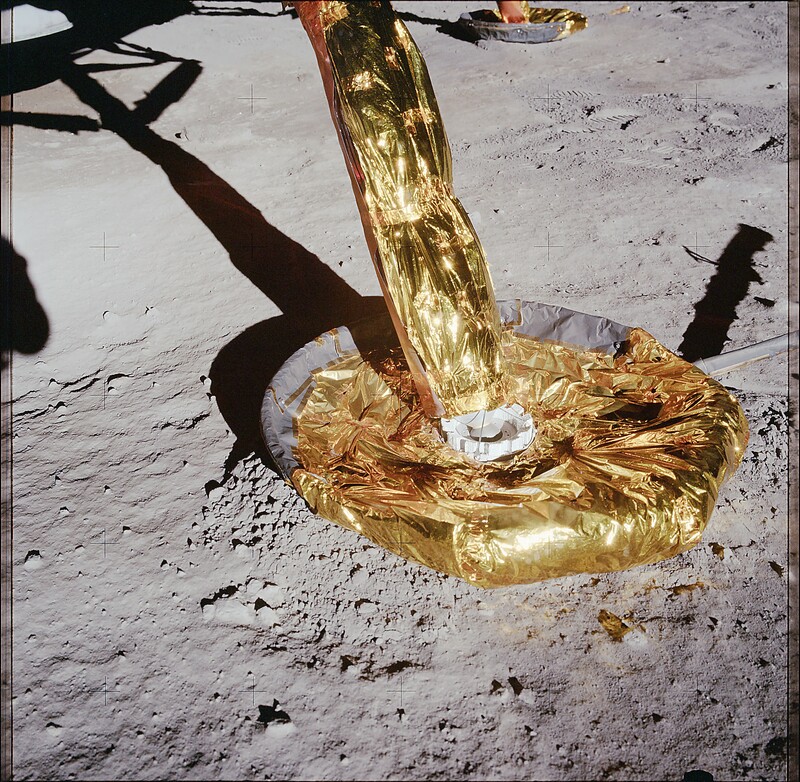 Keep in mind that some, but nowhere close to all, of the exposed soil's reddish hue is due to the actual color of the freshly exposed soil instead of being due to the reddish gold colored aluminized Mylar protecting the underside of the LM's descent stage. Photo 5921  My enhanced version of the above photo. 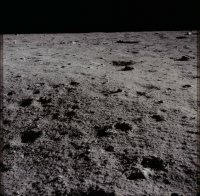 This photo shoots another hole in various conspiracy theories which claim that there are no blast patterns in any of the lunar photos. So, where did the scoured away dust go? It shot away in all directions over the horizon on ballistic trajectories. See Visibility During the Lunar Landings and Outgassing and Dust Lofting from the Lunar Surface after Descent Engine Shutdown for further information. 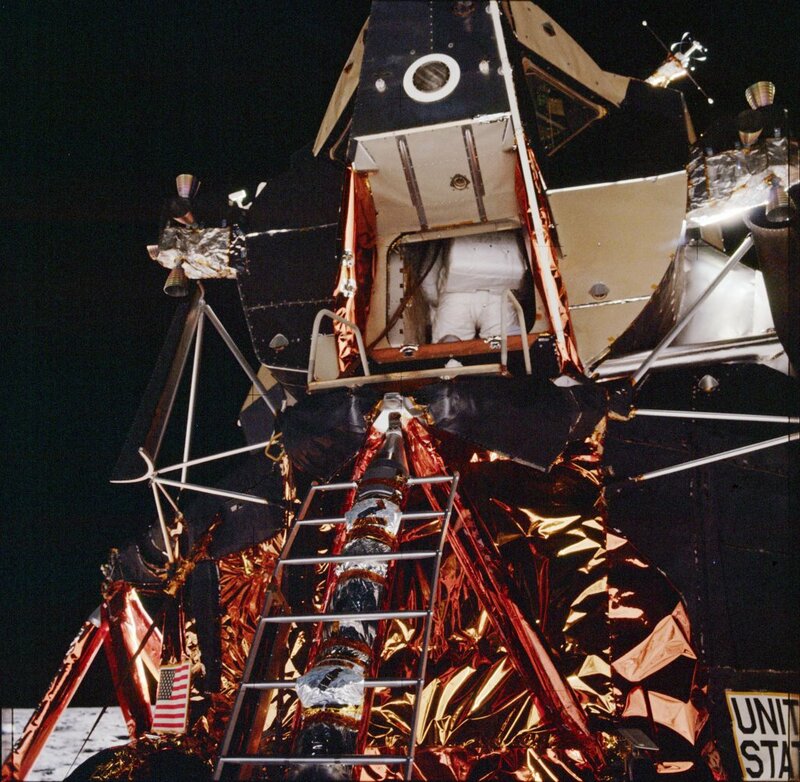 Photo 5924  Fully color corrected view of the back side of the LM, looking up towards the Earth. 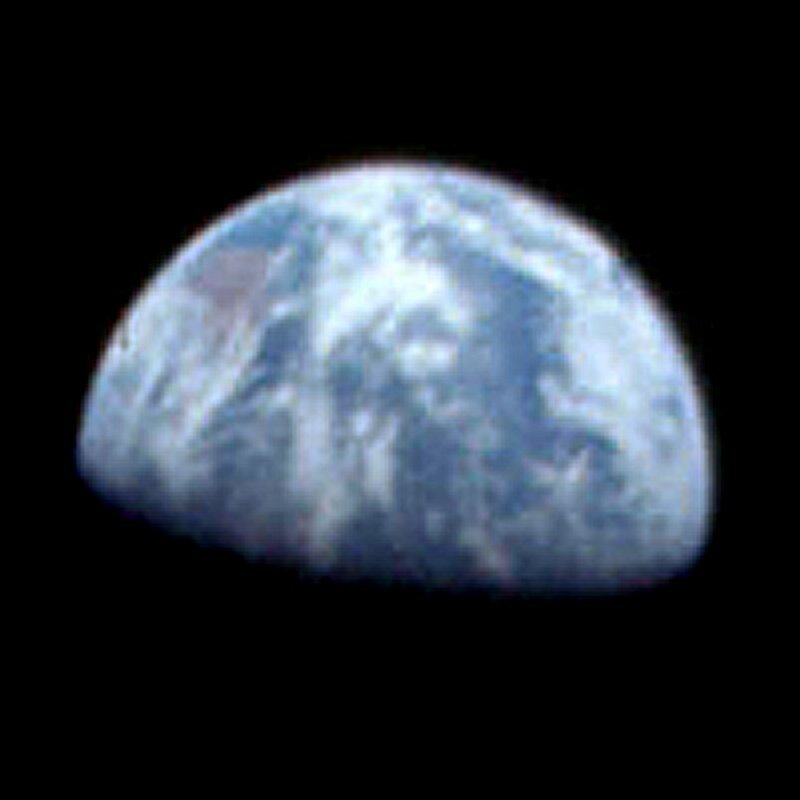 Earth in photo 5924  This is the exact brightness and color of the Earth, as recorded in the above photo, after only color correction was applied to the original film slide. Note that you are seeing the Pacific Ocean and the continent of Australia at the 10 o'clock position. Japan is at the 1 o'clock position at the upper right, but it appears that Japan was covered by clouds. Note that I increased the sharpness and boosted the contrast in the larger linked image in order to make both the cloud patterns and land masses more apparent. Celestia's representation of the Earth from the Apollo 11 landing site on July 21, 1969 at 04:14UT  Pretty much an exact match, isn't it? Well, except for Celestia's simulated cloud cover. This Celestia image of the Earth is on the Earth's bearing relative to the Apollo 11 landing site, and of course looking up at the Earth and greatly zoomed in. Using the Celestia image and the above close-up view of the Earth taken from photo 5924, one can calculate exactly how much the camera was tilted relative to horizontal when photo 5924 was taken. Earth in photo 5924  Blurred and with a hue swatch added to the upper left. This is interesting since the hue comes really close to matching the hue of the Earth shown in my color and distortion corrected visor reflection photo, above. Photo 5924  My enhanced version of photo 5924 further above. Photo 5926  Photo of the LM Eagle's -Z footpad. Photo 5926  Enhanced version of the above photo. 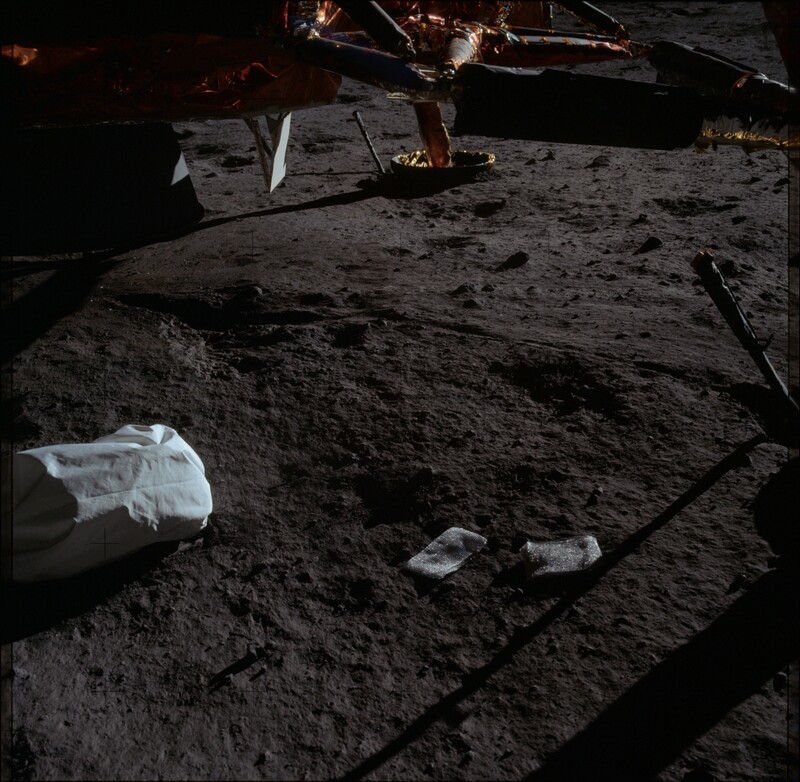 Examine the full resolution version of this photo by clicking on the thumbnail photo and note the patches of lunar dust atop the left half of the footpad. Photo 5927  Aldrin removing equipment from the MESA. Photo 5927  Enhanced version of the above photo, clearly showing the astronaut foot paths. 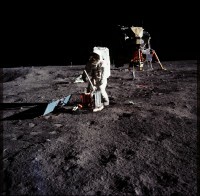 Photo 5931  Aldrin removing equipment from the MESA. Photo 5931  Enhanced version of the above photo, clearly showing the astronaut foot paths. Photo 5932  View to the right of photo 5931, above. Photo 5932  Enhanced version of the above photo, clearly showing the astronaut foot paths. Photo 5947  Aldrin setting up the seismology experiment. 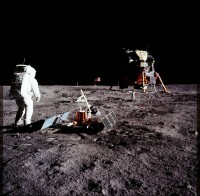 Note the laser reflector experiment in the background which already has been set up. Photo 5947  Enhanced version of the above photo, clearly showing the astronaut foot paths. 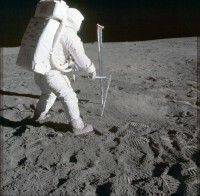 Photo 5948  Aldrin has finished setting up the seismology experiment. 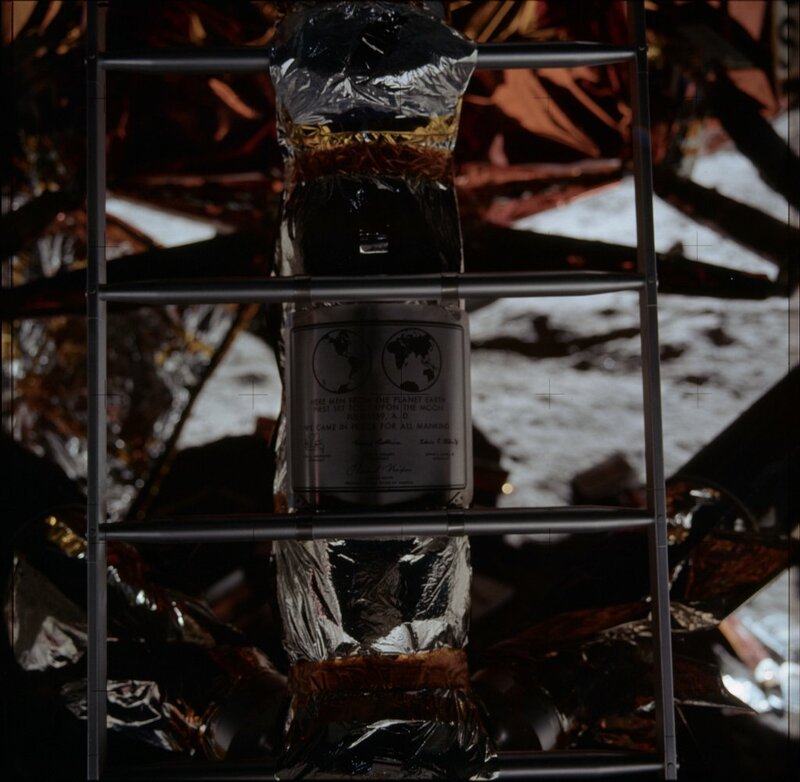 The laser reflector experiment and the TV camera are visible in the background behind the seismology experiment. 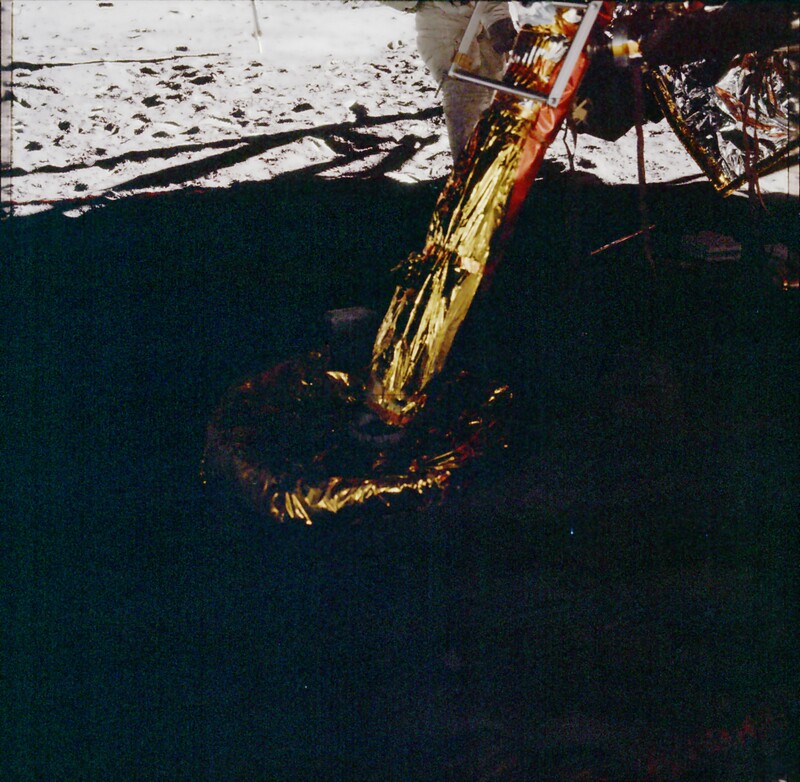 Photo 5948  Enhanced version of the above photo, clearly showing the astronaut foot paths. Photo 5961  Photo of the LM. View is towards the west-northwest. 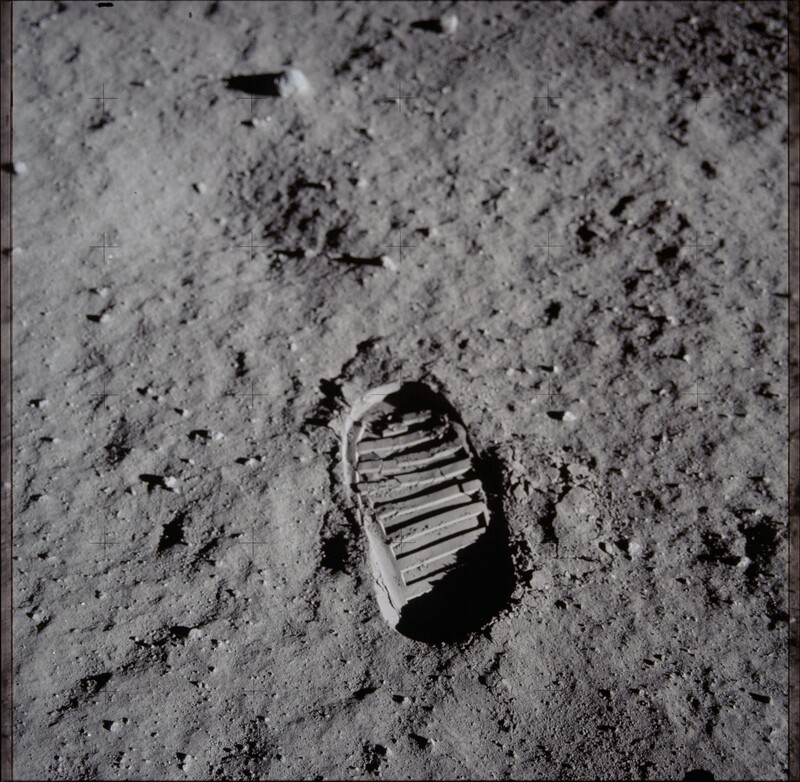 Photo 5961  Same as above photo, but with special gamma curves applied to make the astronaut foot paths much more obvious. Note how the lunar soil tends to more strongly reflect sunlight back towards the direction of the sun and with a distinctly bluish hue. Photo 5962  Photo of the LM. View is towards the west-northwest. Armstrong was walking back towards the LM and snapped closer view of the LM compared to photo 5961. 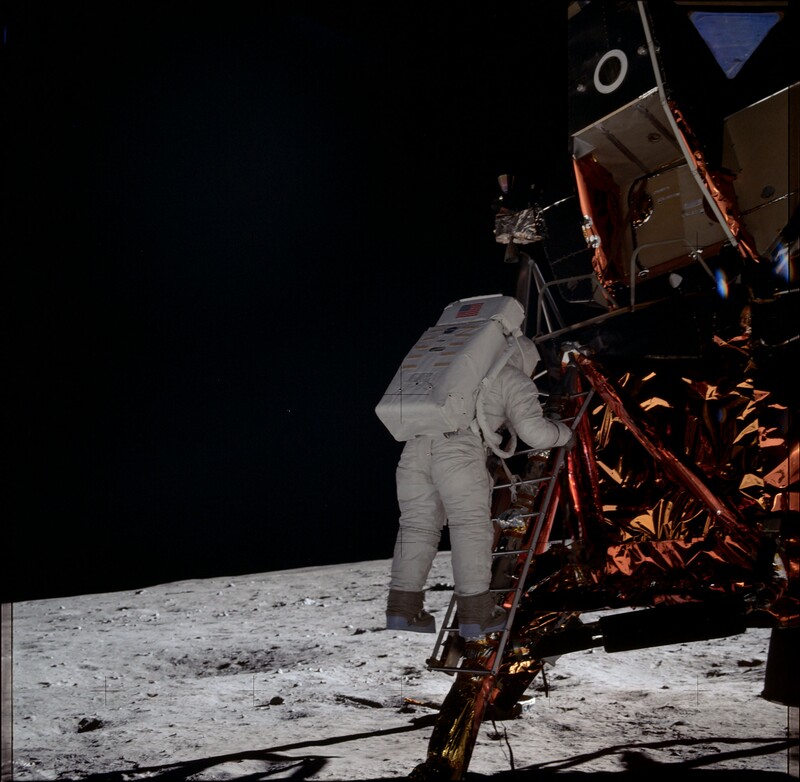 Photo 5962  Same as above photo, but with special gamma curves applied to make the astronaut foot paths much more obvious. Note how the lunar soil tends to more strongly reflect sunlight back towards the direction of the sun and with a distinctly bluish hue. Photo 5963  Color balanced. 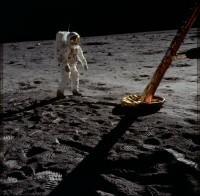 Aldrin preparing to retrieve the solar wind experiment. Photo 5963  Same as photo at left, but with lens vignetting removed. Photo 5963  Same as above right photo, but gamma increased. Photo 5963  Same as 5963 photo with vignetting removed, but with special gamma curves applied to bring out details in the terrain. The custom gamma curves make the LM decent engine's bright blast trail quite obvious. Compare the blast trail to photo 5903 above. Remarkable, isn't it? 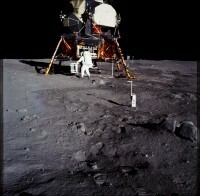 Hoax believers claim that the blast trail shown in 5903 is due to a spotlight. Yet here is the same blast trail, plain as day, once this photo was enhanced to bring out details on the lunar surface. Photo 5964  Color balanced. Aldrin preparing to retrieve the solar wind experiment. Photo 5964  Same as photo at left, but with lens vignetting removed. Photo 5964  Same as above right photo, but gamma increased. Photo 5964  Same as 5964 photo with vignetting removed, but with special gamma curves applied to bring out details in the terrain. 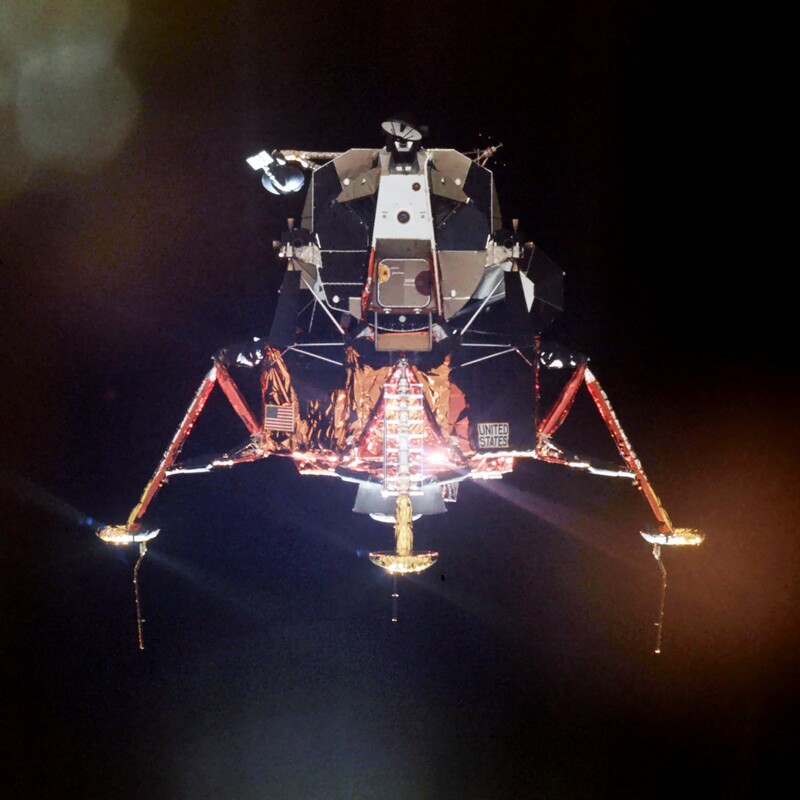 The LM decent engine's bright blast trail is obvious. Photo 5963 Antenna Close-up  While the antenna appears to be located close to the nearer side of this rear side view of the PLSS backpack, the antenna really is located on the top left side of the PLSS backpack when the PLSS backpack is viewed directly from behind. 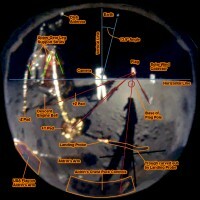 Read additional comments in the linked high resolution photo. Photo 5964 Antenna Close-up  Fabric at top of PLSS backpack completely blocks a view of the antenna's base since the back of the PLSS backpack is turned more towards the camera in this photo. Overlay of photos 5865, 5963 and 5964  I chose to overlay photos 5963 and 5964 atop photo 5865 since photo 5865 is nicely illuminated at the top of its frame. I aligned the photos using the each photo's center reseau cross. As you can see, all of the other reseau crosses line up as well. You can also see exactly where the top edge of the frame is for photos 5963 and 5964 since the well lit top portion of photo 5865 clearly shows the top edge of the frame. 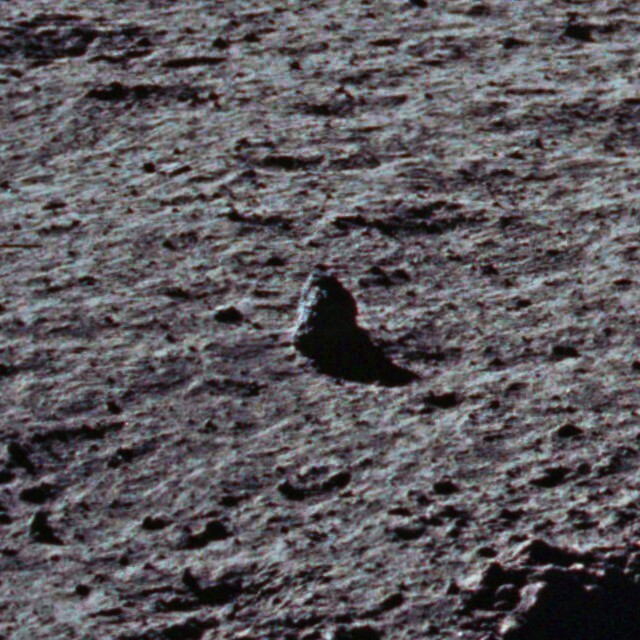 Close-up of the "Eagle" from picture 6598  This my cropped, color corrected and enhanced version of photo 6598. Photo 6642  Color corrected raw image. 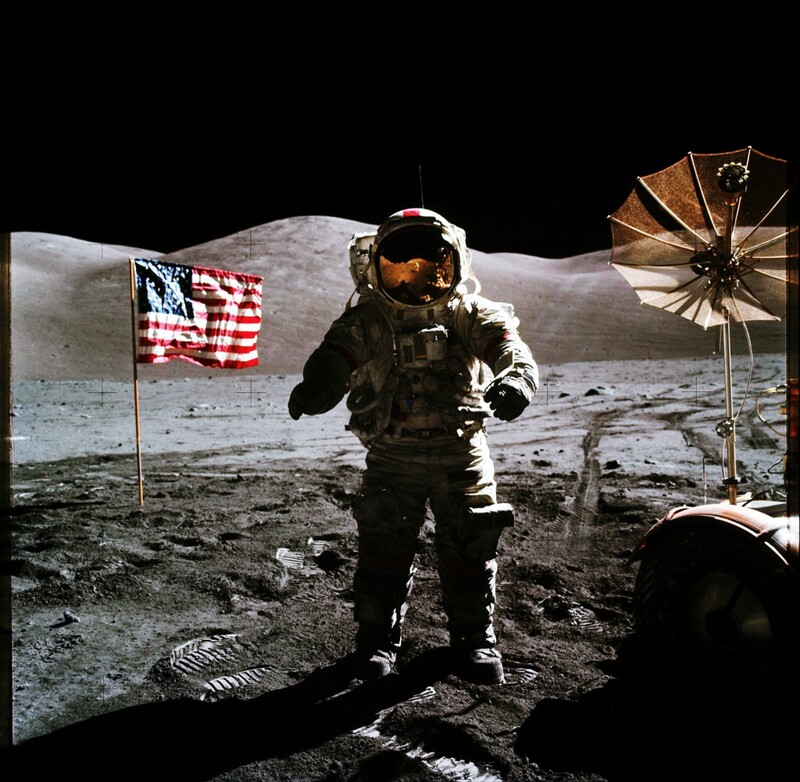 Photo 6642  Above, but gamma correction applied. Photo 6642  Above, but colors greatly enhanced to accentuate the moon's hues. 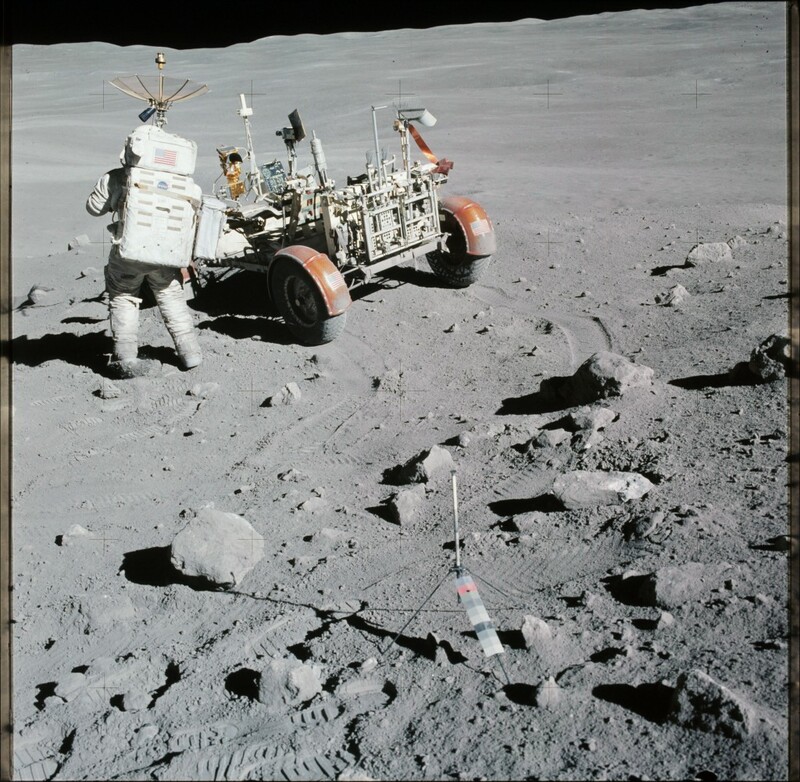 Photo 11839  A nice photograph of the LM "Falcon" resting on the moon. 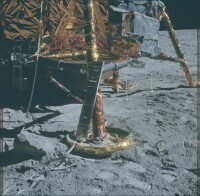 Note the pieces of metallized Mylar insulation both atop the near footpad and resting on the surface to the right of the near footpad. 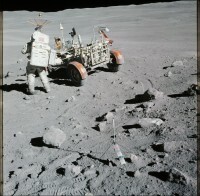 Also note the lunar rover and astronaut which is visible in the distance to the left of the LM. Photo 11865  Color balanced. Photo 11865  Same as left, but contrast and curves applied. 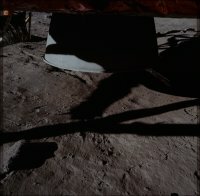 Photo 11865  Same as above right, but curves were adjusted to accentuate brightness and hue differences in the terrain, showing more terrain details than what the astronauts could see with their eyes. 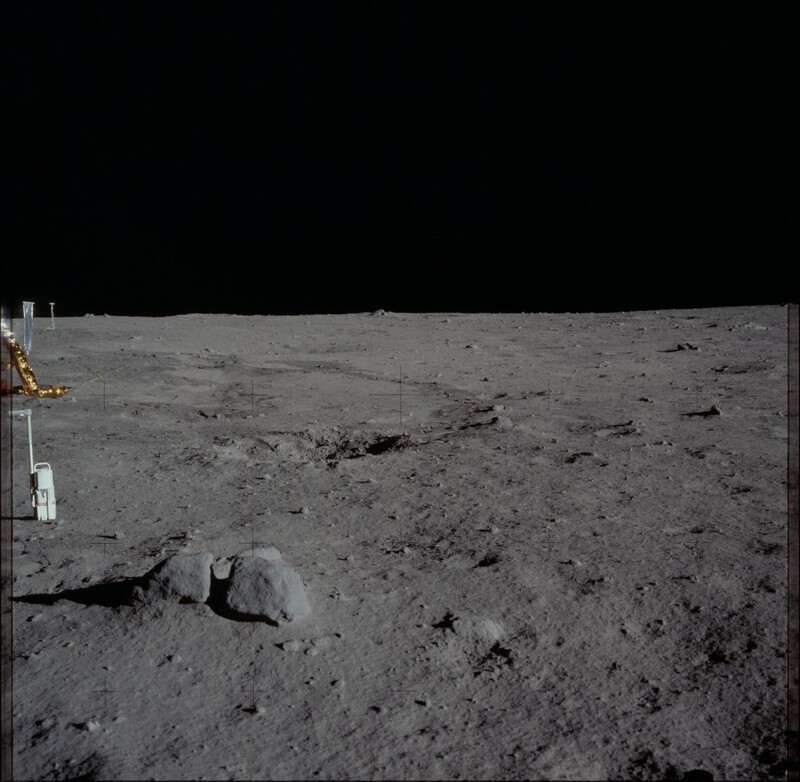 Note the striking soil differences which are visible on the distant mountain. Note: In general, the Apollo 16 photographs were overexposed by up to 1 f-stop. 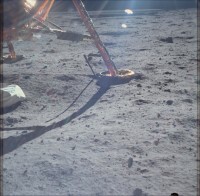 The higher sun illumination angle significantly increased the apparent brightness of the lunar surface, resulting in obvious blue fogging of the films due to internal reflections within the Zeiss 60mm Biogon lens. The general fogging and loss of overall contrast is a result of the two flat optical surfaces on either side of the aperture diaphragm within the lens. Those surfaces only had single layer MgF2 coatings since reliable lens multi-coating technology was still nearly a decade in the future. Photo 17441  Raw image. Photo 17441  Above, but color corrected, noise removed, sharpened, and gamma correction applied. 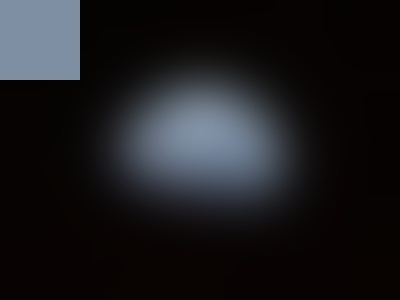 Denoising the image adds faint swirl patterns to dark areas of the photo. Photo 17442  Raw image. Photo 17442  Above, but color corrected, noise removed, sharpened, and gamma correction applied. Denoising the image adds faint swirl patterns to dark areas of the photo. Photo 17446  Color balanced. Photo 17446  Same as left, but contrast and curves applied to better reproduce what the astronauts saw. 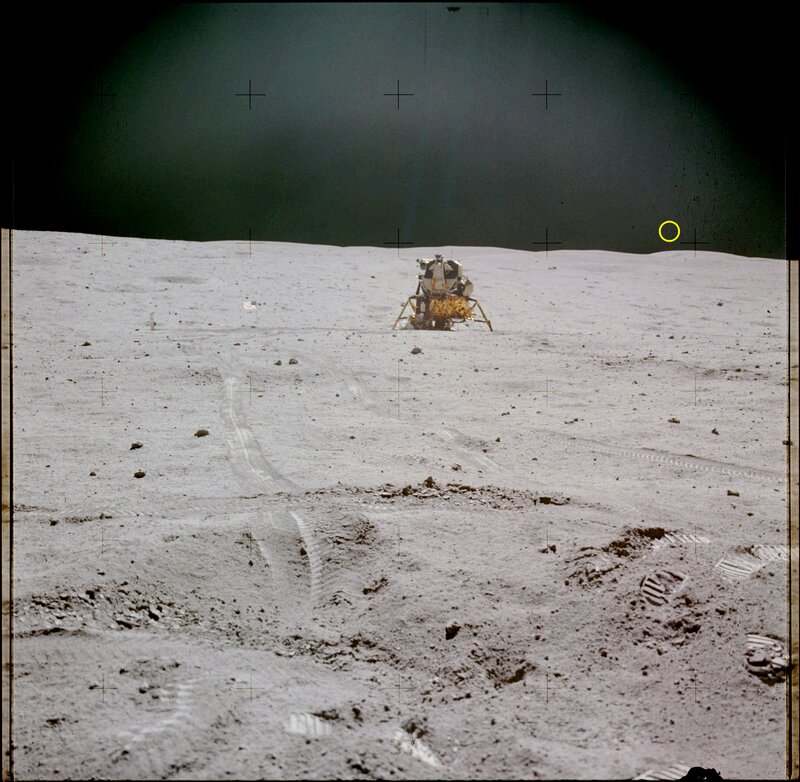 Photo 17446  Same as above right, but curves were adjusted to accentuate brightness and hue differences in the terrain, showing more terrain details than what the astronauts could see with their eyes. The bright streaks are interesting and likely are caused by meteorites impacting the surface at very shallow angles. Also note that the hilltops generally are white. This perhaps suggests that meteorite impacts at the tops of the hills throw debris down onto the sides of the hills. This seems plausible since the lower sides of the hills generally are darker than either the hilltops or the flat terrain. 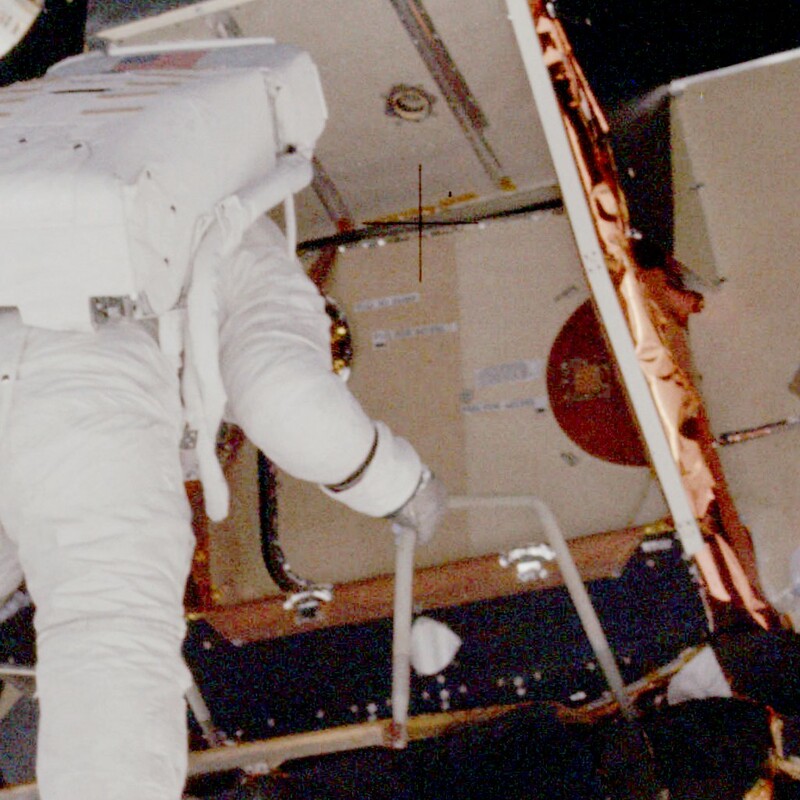 The astronauts unknowingly photograph Venus in three consecutive photos! Venus is circled in yellow in all three of these photographs. You really do have to look at the full resolution photos (by clicking on the thumbnail pictures) in order to see Venus inside the yellow circles. Look at the direction of the lunar rover's wheel shadows in the last photograph and you will realize that the sun was fairly high in the sky above Venus. Location of Venus, Mars and the sun above the east horizon  Celestia shows us that Venus was quite low in the east sky below the sun throughout the time period of the EVA. Celestia close-up view of Venus and Mars above the east horizon  Knowing the true altitude of Venus (a bit over 2-1/2 degrees), one can deduce the ground slope towards the east horizon in photo 18817, above, by using the 10mm spaced reseau tick marks as your reference points and the knowledge that the Biogon lens has a focal length of 61.1mm and virtually zero (well under 1%) distortion. 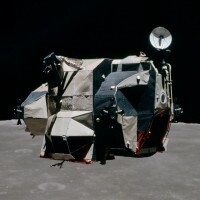 Photo of the LM "Orion"
photo of the LM "Orion". A rotated crop of the above right photo which nicely shows the LM "Orion". Special filters were applied to remove background noise. 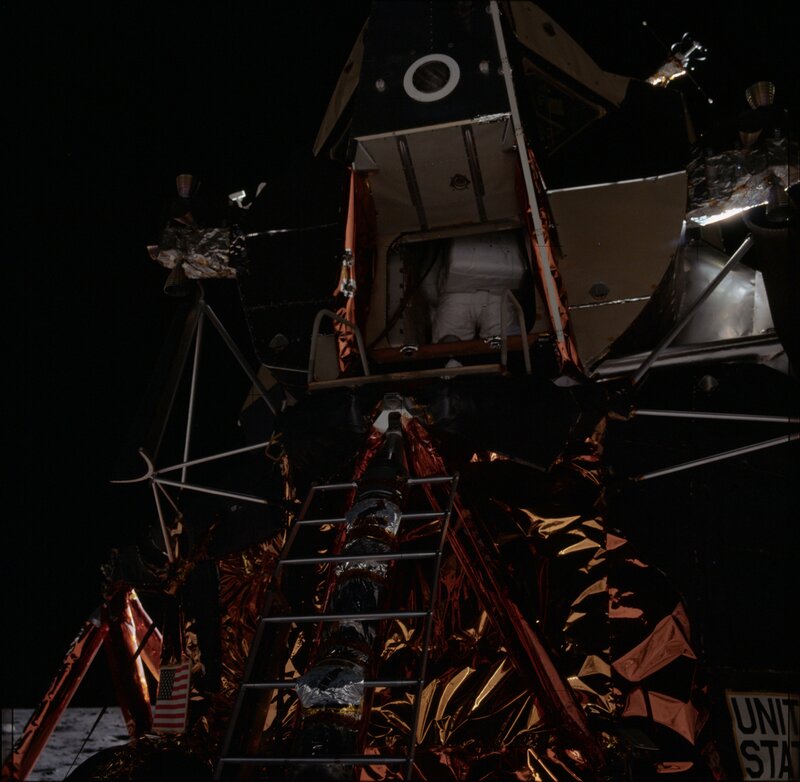 Orion looks a little worse for wear and tear after returning from the lunar surface. 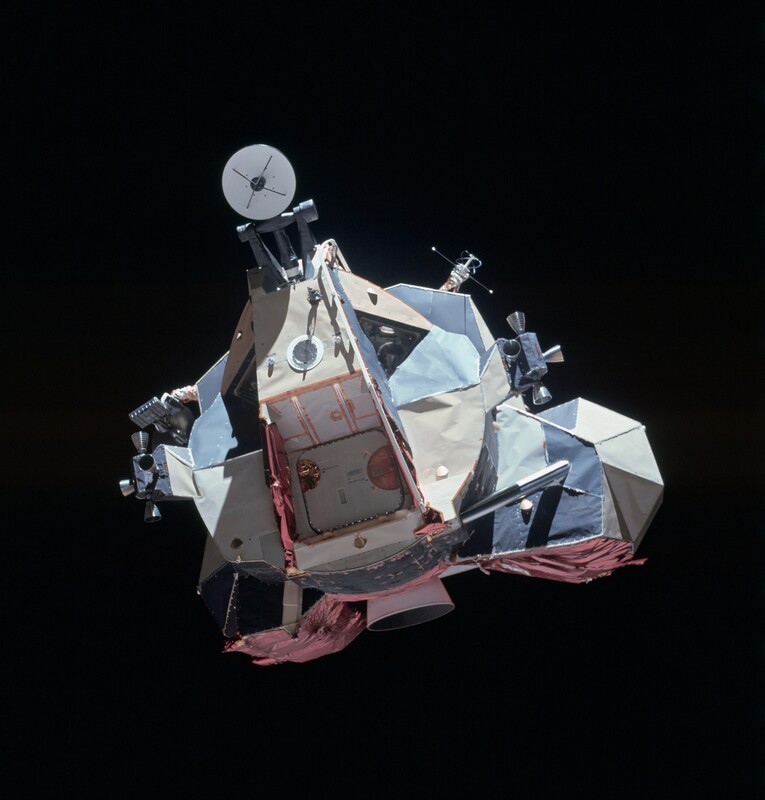 Note what appears to be bubbled and peeling paint on the sides of the LM. Our planet Earth once again reflected in an astronaut's visor  in three consecutive photos! But I will just show the best of the three photos. 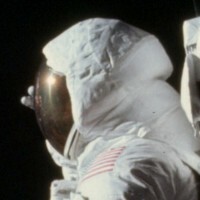 Later I will add visor close-ups from all three photos. Photo 21391  Raw image, color corrected. Photo 21391  Raw image, color corrected, strong gamma curves applied. You will clearly spot the earth in the visor. 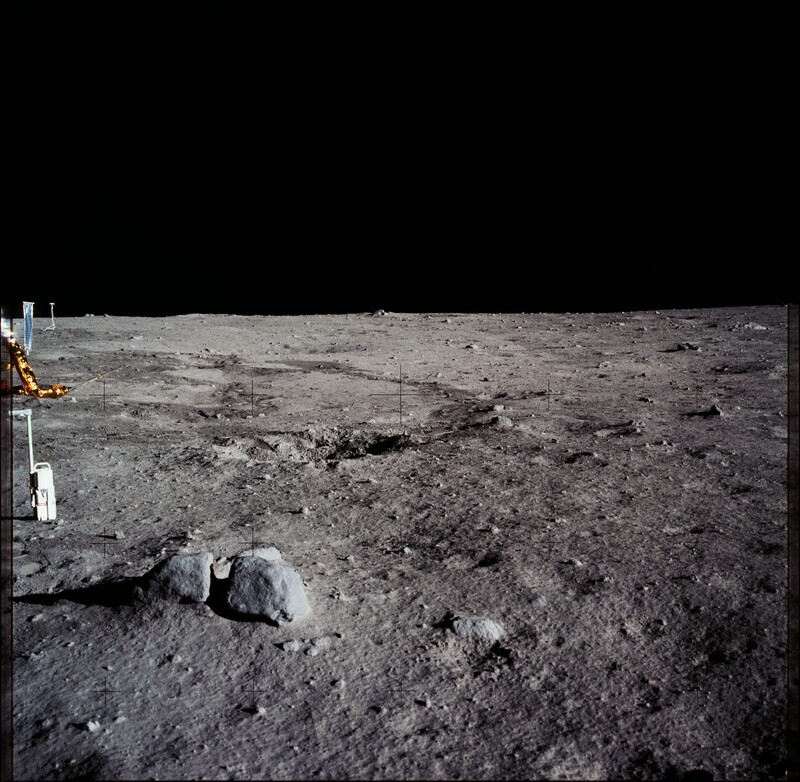 Photo 21391  Raw image, color corrected, but with strongly shaped gamma curves applied in order to bring out the terrain details as well as the subtle hues. 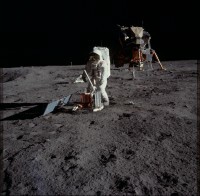 Look closely to the right of the astronaut. You will see two distinct ridge lines before the distant mountain range. Also note the horizontal rippling along the near side of the distant mountain. Photo 22857  Color balanced. 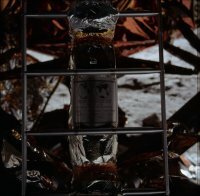 A really nice view of the the "Challenger" LM ascent stage.